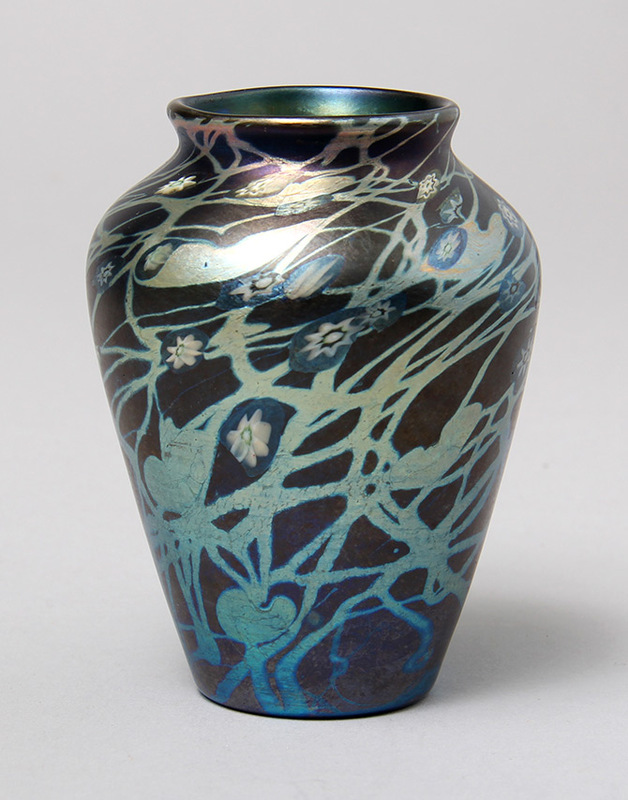 The color and contrast on this Tiffany Favrile floriform vase are a step up from other examples. Just look at the incredible workmanship and intense colors. It's a beauty! At 9" tall, it's the perfect cabinet size. Signed. Mint condition. 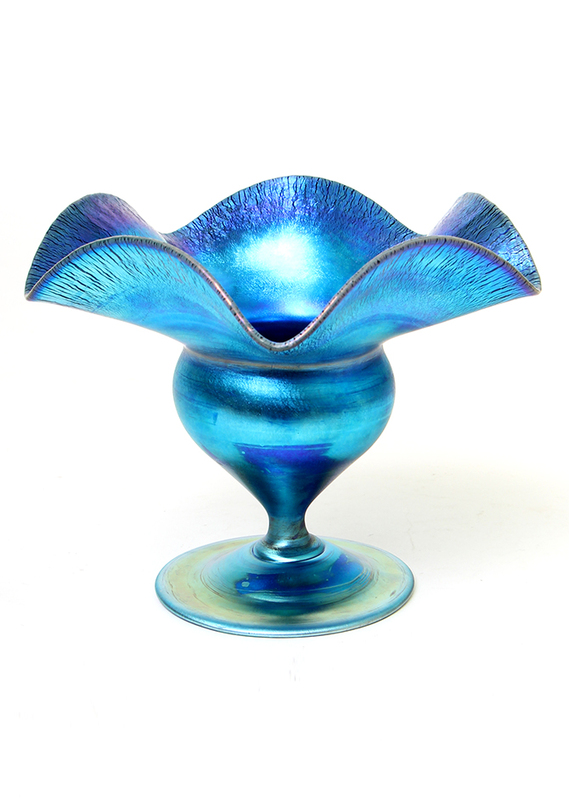 This is an outstanding example of Tiffany green leaf on gold iridescent glass. The workmanship in the flowers is outstanding, as well as the colors and iridescence. It's a nice, big example at 14¾" tall. 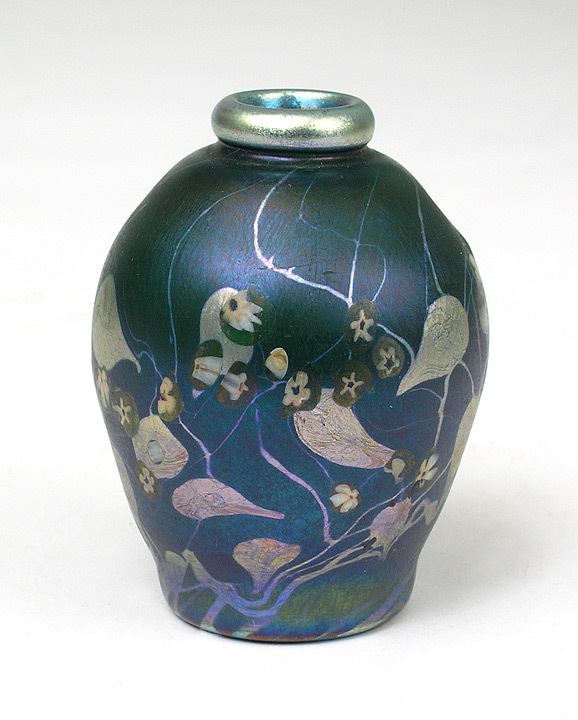 Signed 688E L.C.Tiffany-Favrile, which dates it to approximately 1910. Mint condition. 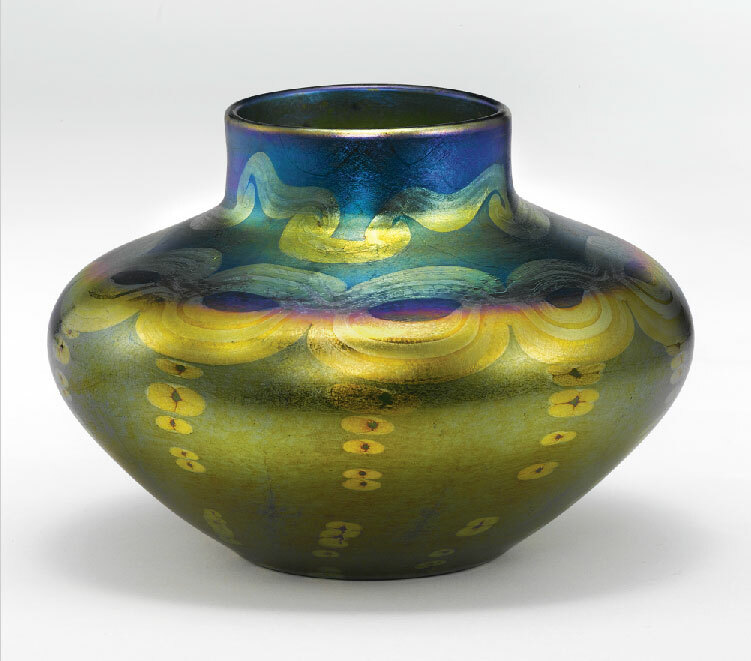 This superb example will add nicely to any Tiffany Favrile glass collection. 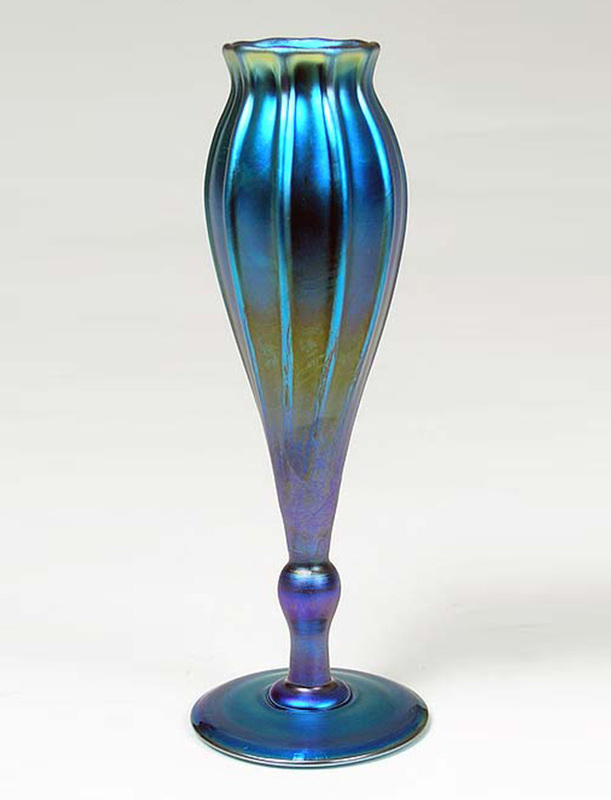 The core of many Tiffany Favrile glass collections is often a Jack-in-the-Pulpit vase. The quality varies from example to example. This one has all the qualities to look for in a desirable example. It's tall, 20"; the mouth is large; the iridescence is strong; the condition is excellent (with a few minor scratches around the foot). 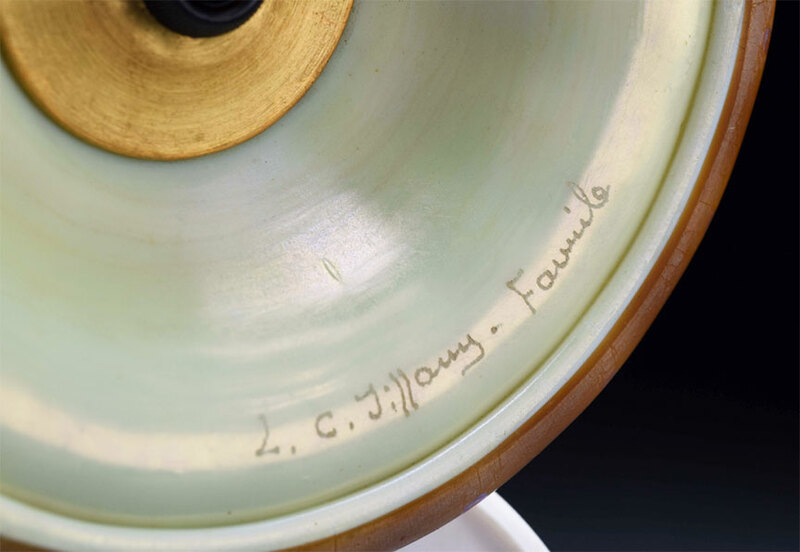 Engraved signature on the underside. 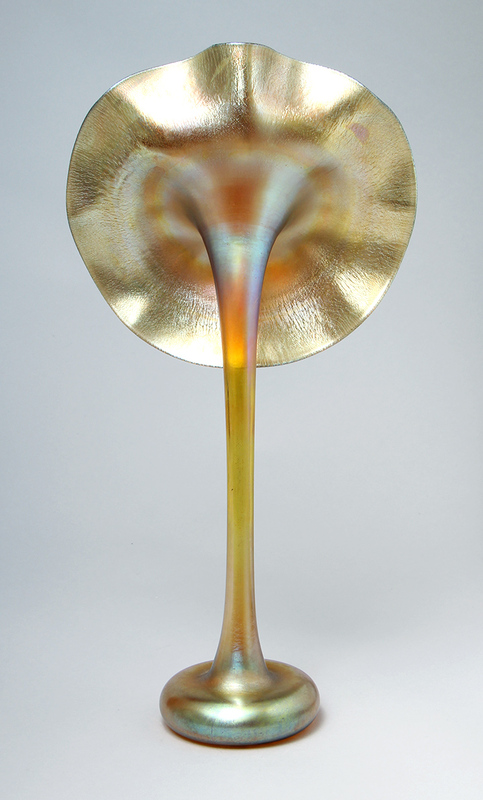 Tiffany produced Jack-in-the-Pulpit vases to impress and this one fits the bill. 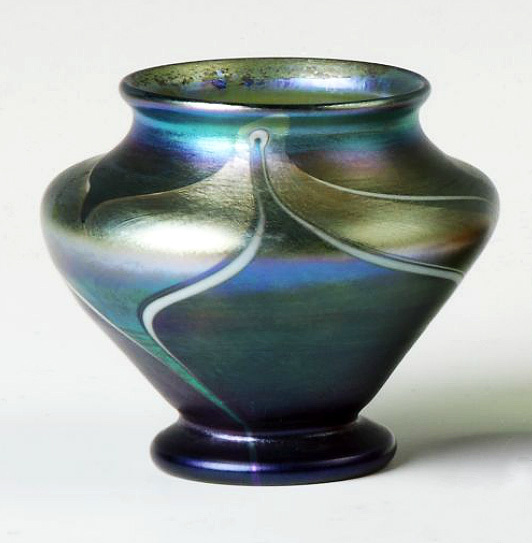 Tiffany produced pastel glass in the 1920s after Douglas Nash took over the factory. Pastel glass was meant to be both beautiful and utilitarian. 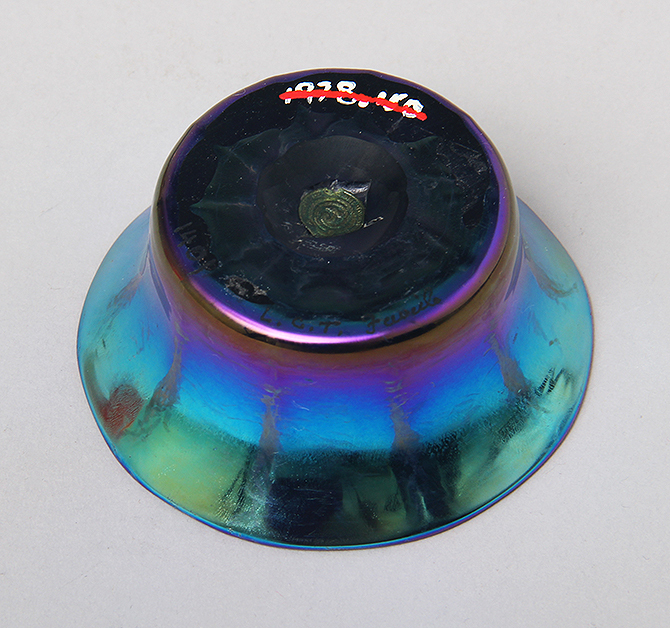 It came in approximately five colors, with purple being one of the prettiest. 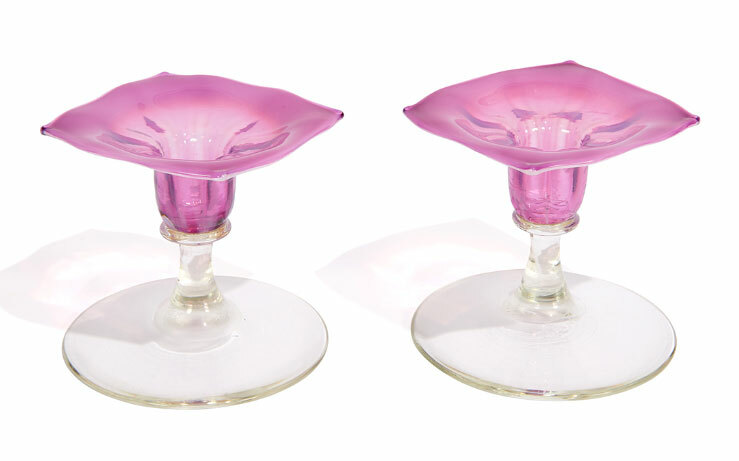 This elegant pair is unusual in that the candle tops are square. 3½" tall. Each signed and numbered. Mint condition. As most of you know, red is the rarest and most desirable of Tiffany Favrile colors. This example is not only strong red, but is also decorated with a blue-black hooked decoration. 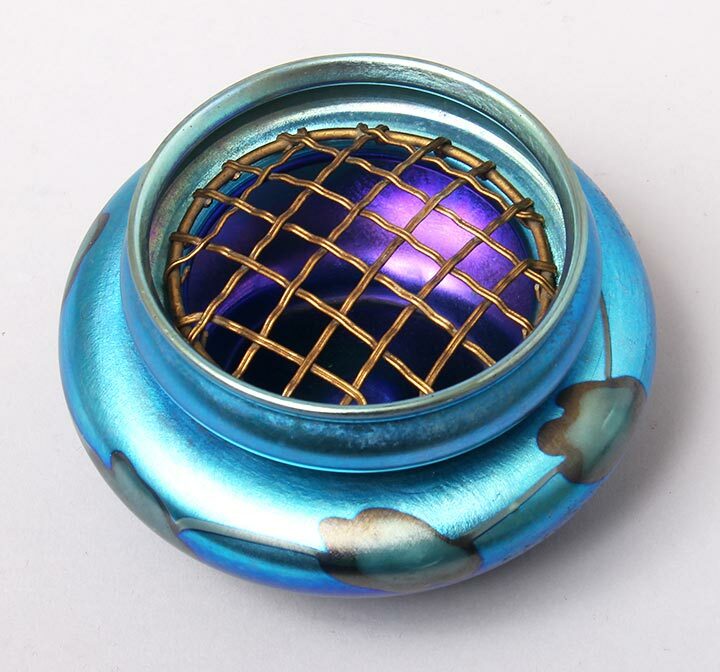 It's not large, at 3½" tall x 4" diameter, but it's superb quality. Signed and numbered. Mint condition. 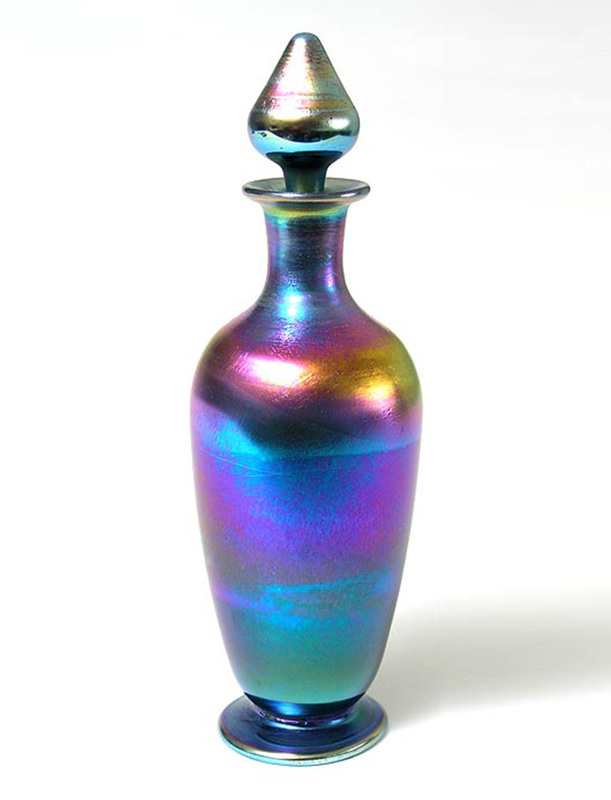 When do you see color like this on a Tiffany Favrile vase? It's the richest turquoise, deep ocean blue, you could ask for. 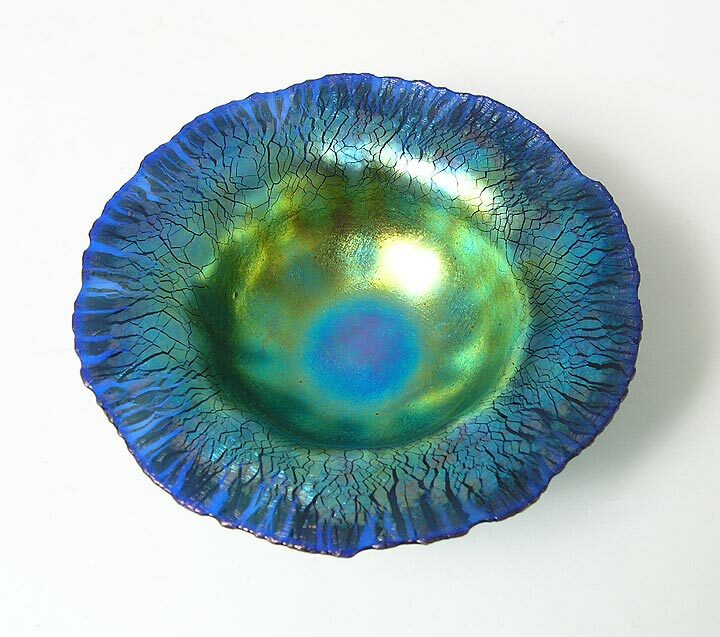 Between the blue and the opal background, a gold iridescent hooked feather decoration was put. It's a real beauty. 5½" tall. Signed. Mint condition. I rarely get 10" diameter Tiffany Favrile shades for sale by themselves. This is one of those rare opportunities. 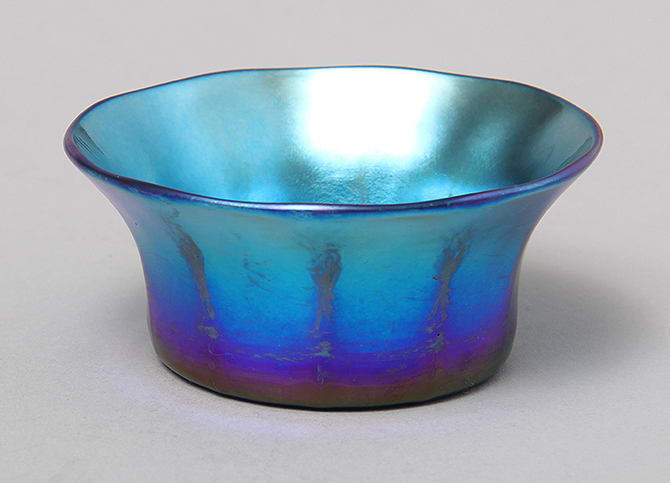 The shade is quite beautiful, with typical Wave decoration and excellent iridescence. Additionally it has ribs that show especially well when the shade is lit. 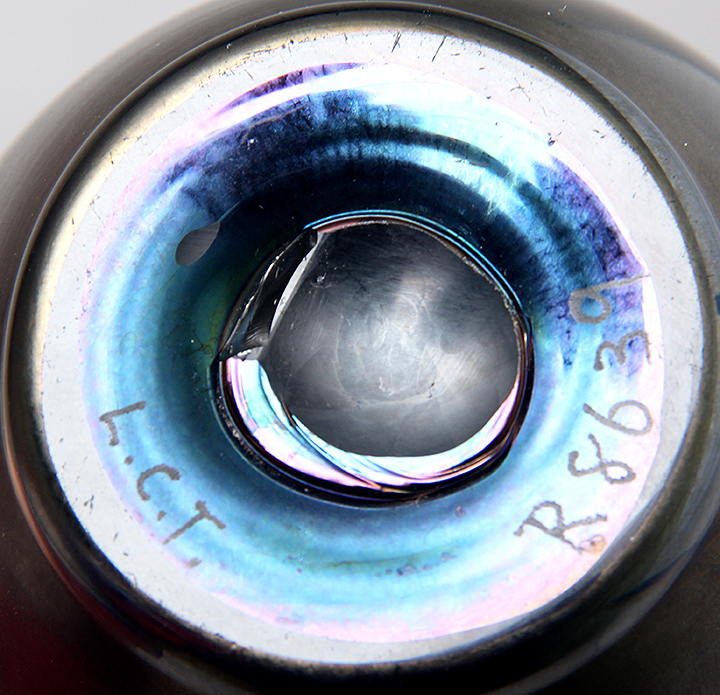 The fitter diameter is 3¼", not 2¼", so it will fit either in a 10" ring or a lamp base with a larger fitter. Signed "L.C.T. Favrile" in the fitter rim. Mint condition, with no grinding or restoration. 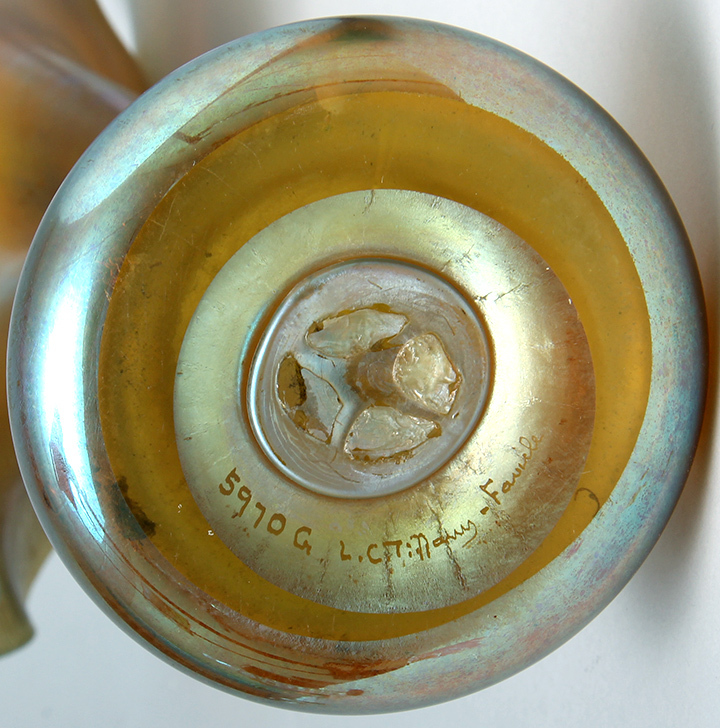 The French frequently used acid-etching to create designs, but Tiffany rarely used the technique. 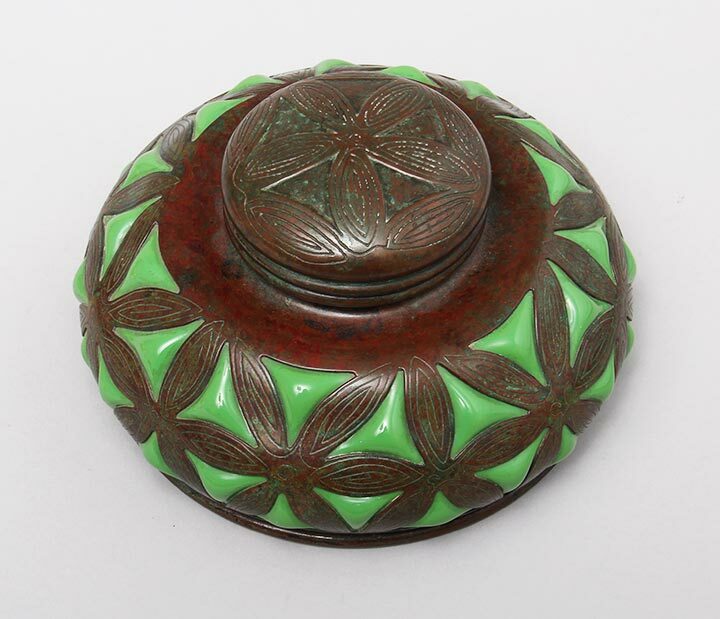 Here is a fine, rare example with maple leaf decoration. 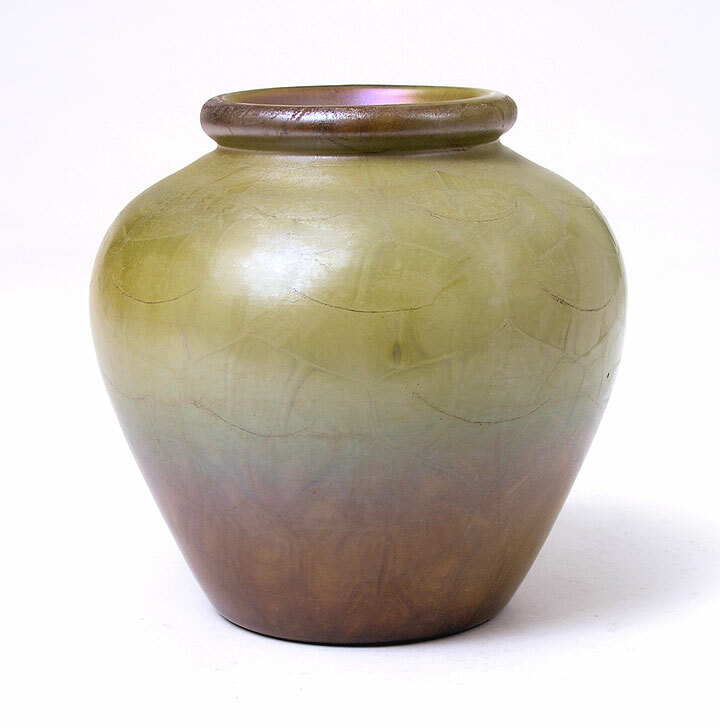 Nice bulbous shape, with applied foot and sized at 8½" tall. Signed. Mint condition. 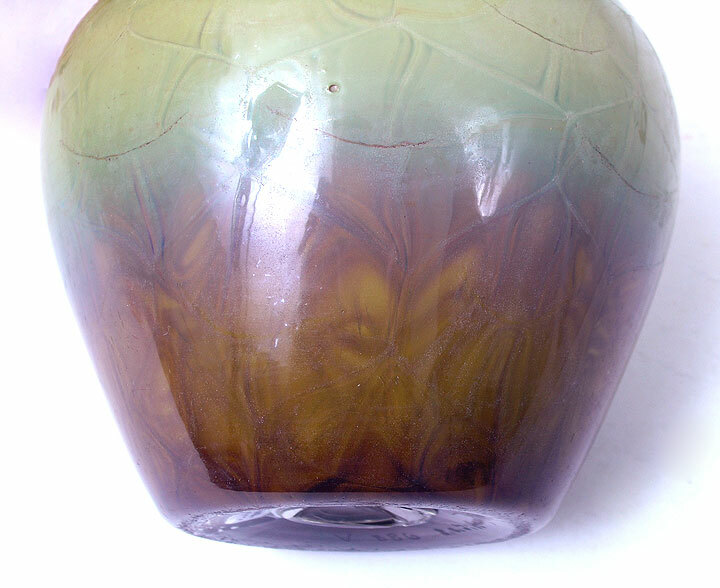 Straight from a fabulous private collection comes this really great and very rare Tiffany Favrile Agate vase. Incredible quality. 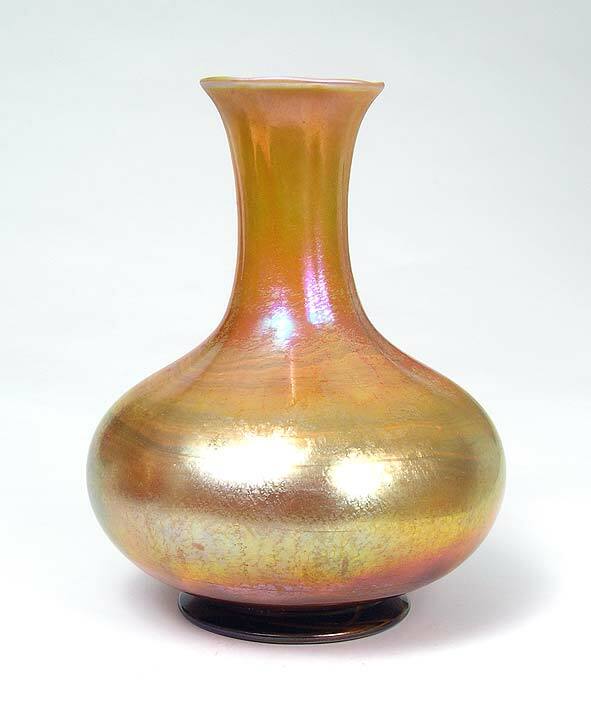 Heavy vase, with thick glass. For the BEST collections. 5½" tall x 5½" diameter. Signed "V886 L.C.T. Favrile". Mint condition, except for a tiny open bubble in the making, only mentioned for accuracy. 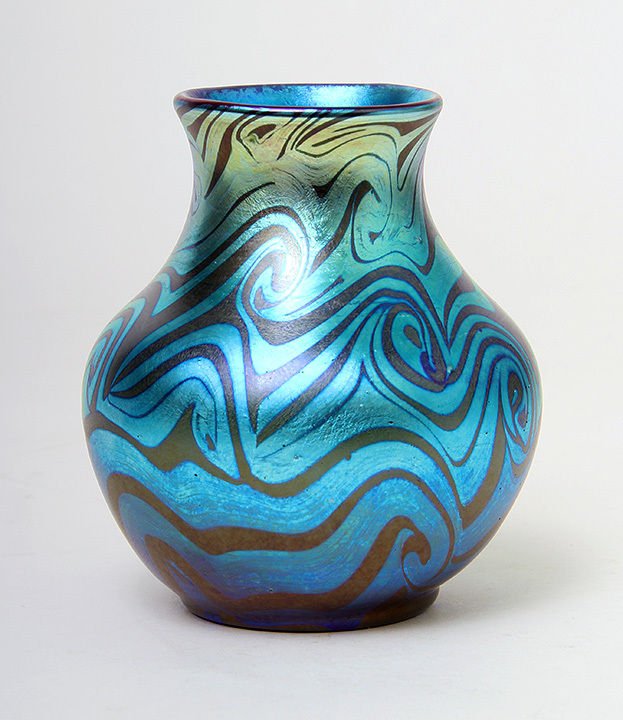 Very attractive vase with unusual swirl pattern throughout, extending all the way to the undersurface. Good iridescence. Solid, heavy vase. Nice cabinet size at 8½". Signed. Mint condition except for a couple of scratches on the widest part of the vase. Very fairly priced. 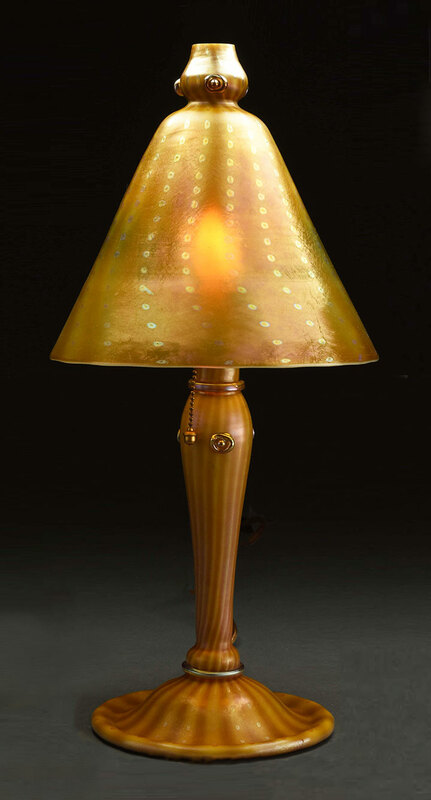 Tiffany Arabian lamps come in different varieties, with the most desirable having matching glass bases. They also come with bronze bases (which are less desirable). 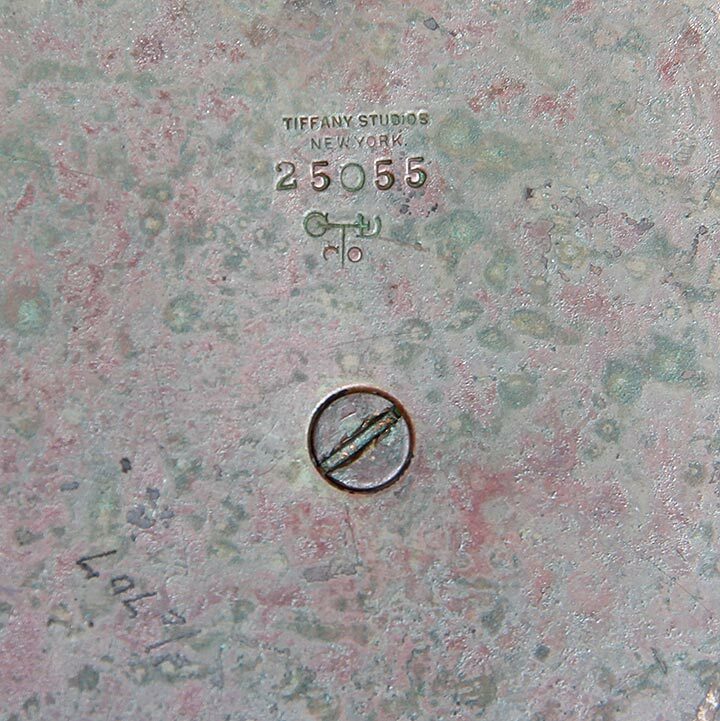 Unfortunately many examples have been bastardized to create examples which Tiffany never created. This example has no excuses. It's all original, except for the wiring and plug (which you do not want original because of the fire danger). The color match is excellent between the shade and base; they're both properly signed; the socket and acorn pull chain are original; and the condition is mint. It's a great example for any fine Tiffany collection. You couldn't ask for better. 14¼" tall. Is this vase killer, or what? I just got it from a great private collection. 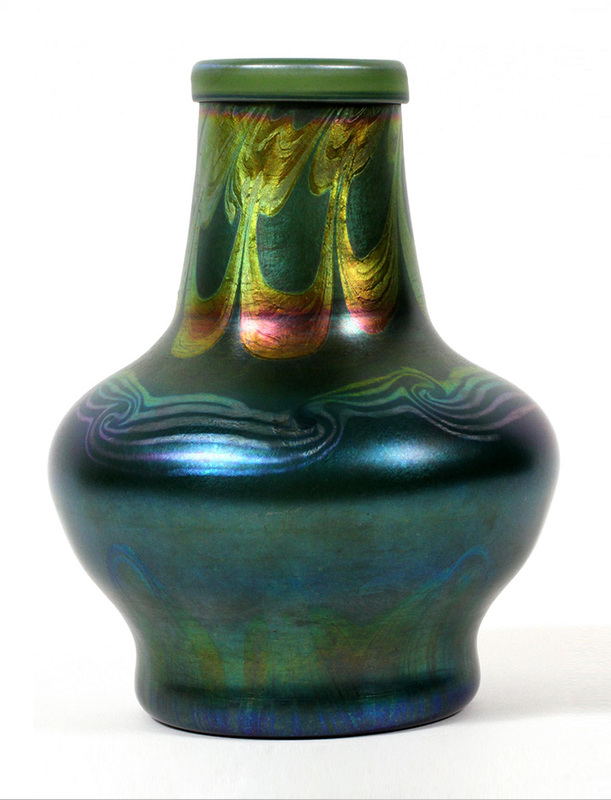 It's called a black decorated vase, but you can see it's got a lot more color than that. It's decorated with gold hearts & vines, with blue trailings. It's the most outstanding example of a Tiffany Favrile black vase I've ever had the pleasure of owning. Nice size at 9" tall. Signed. Mint condition. For the best collections. 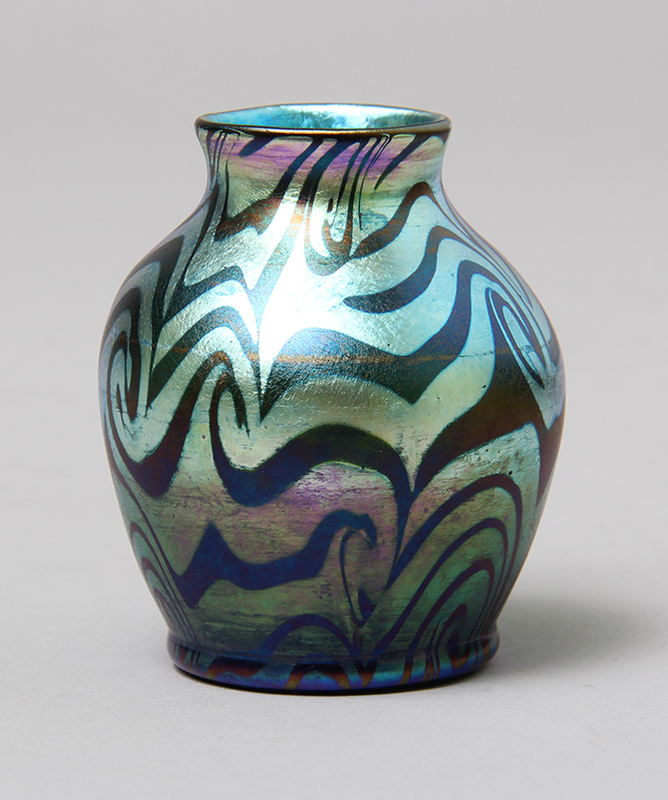 I've been continually buying great Tiffany Favrile glass from an important American collection. This is my most recent purchase. 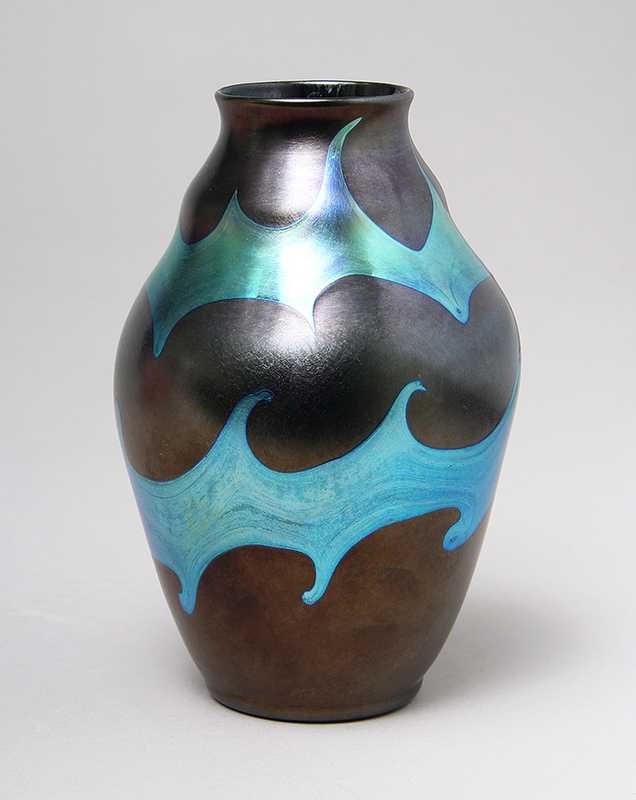 It's a fabulous black vase with strong blue turquoise iridescent decoration, continously coiling around the body. It just goes to show you the level of quality in this collection. Nice size at 6½" tall. Signed. Mint condition except for a chip to the button of the pontil (which is totally unimportant, but mentioned for accuracy). 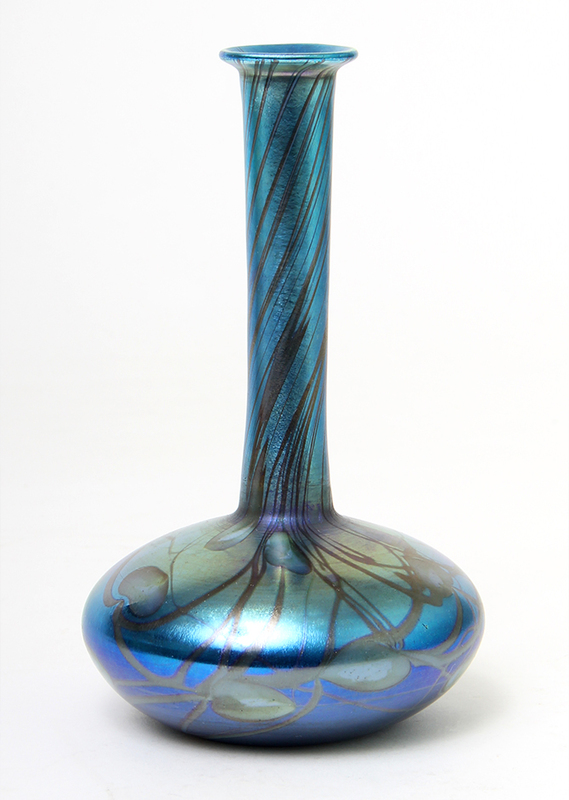 Tiffany black decorated vases are a rarity and this one is special with the intricate blue pulled decoration. Great contrast with the background. 12". Signed. Mint condition. 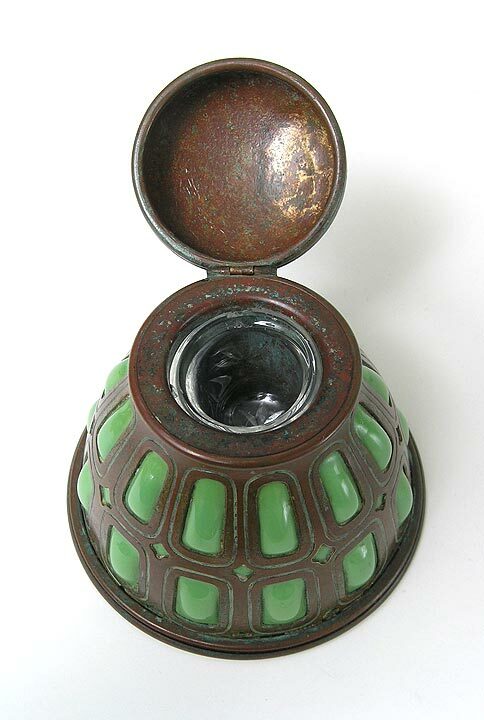 I've only owned a few Tiffany Studios blownout inkwells over the years and never this model. They're special because the gaffer first started with the metal cage and blew the glass into it. It cannot be removed. 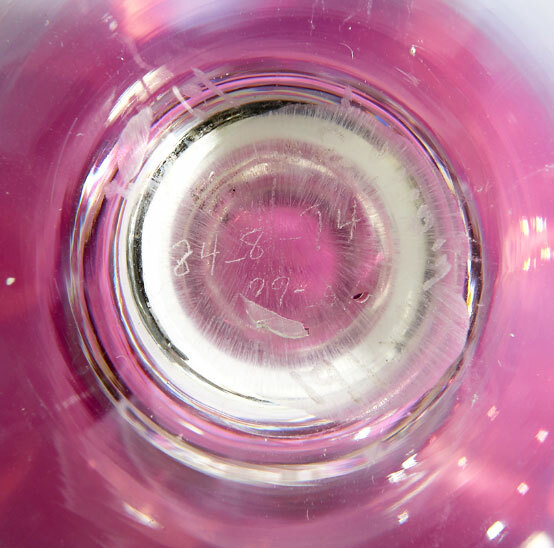 Additionally, condition is very important, as it's easy to damage the glass. This example has been treated with kid gloves. 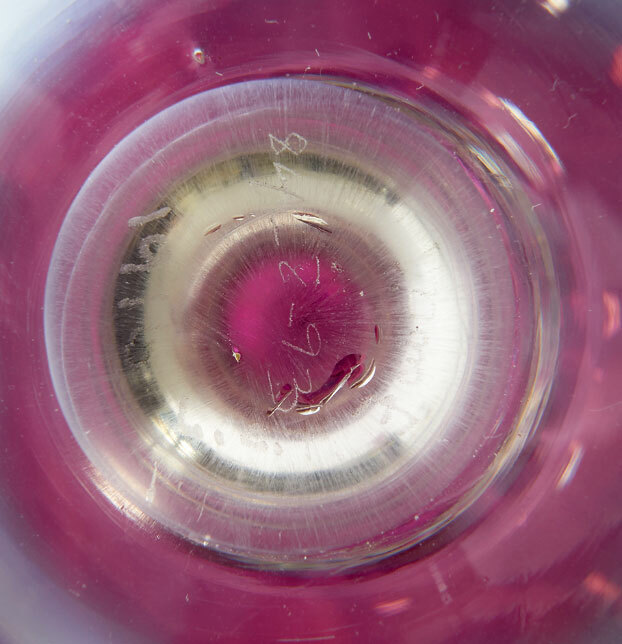 It's in impeccably fine condition with no damage to the glass and with a rich original patina to the metal. 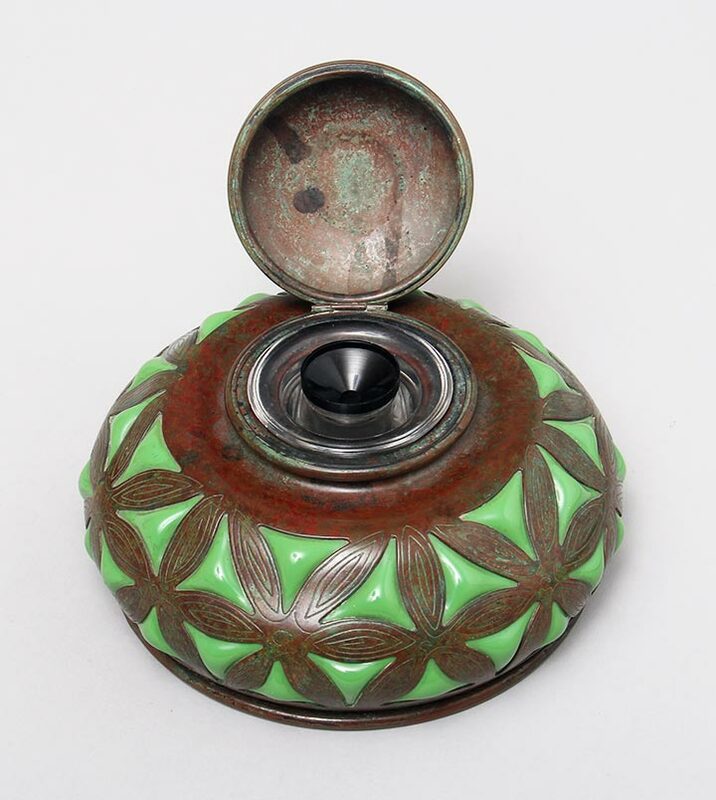 Larger than the usual inkwells at 7" diameter. Signed. 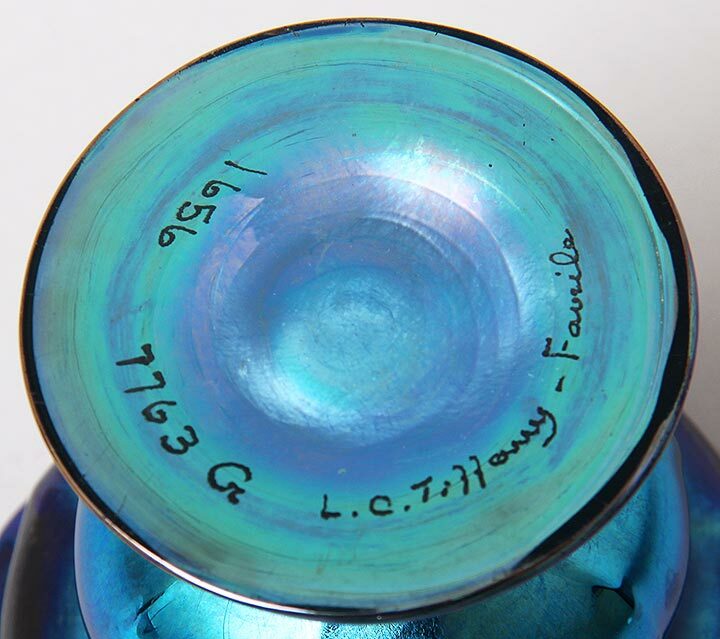 Tiffany Favrile blue salts are much rarer than gold salts. This example is even rarer because it has two pulled handles. Add to that the intense blue color and excellent iridescence and you've got a very desirable salt. Signed. Mint condition. 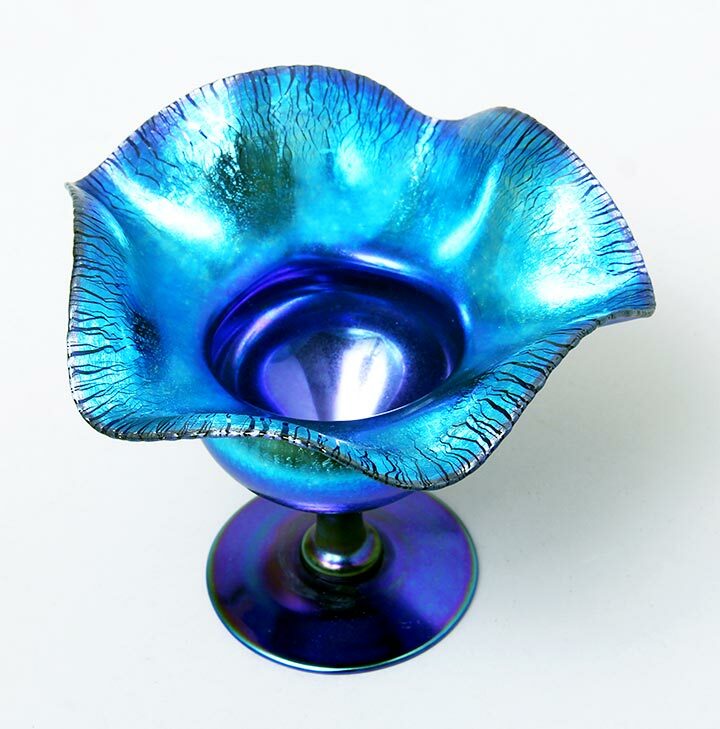 Tiffany Favrile compotes are fairly common in gold and rarer in blue, especially gorgeous blue with purple highlights. I've owned this model several times before and this example compares with the best. 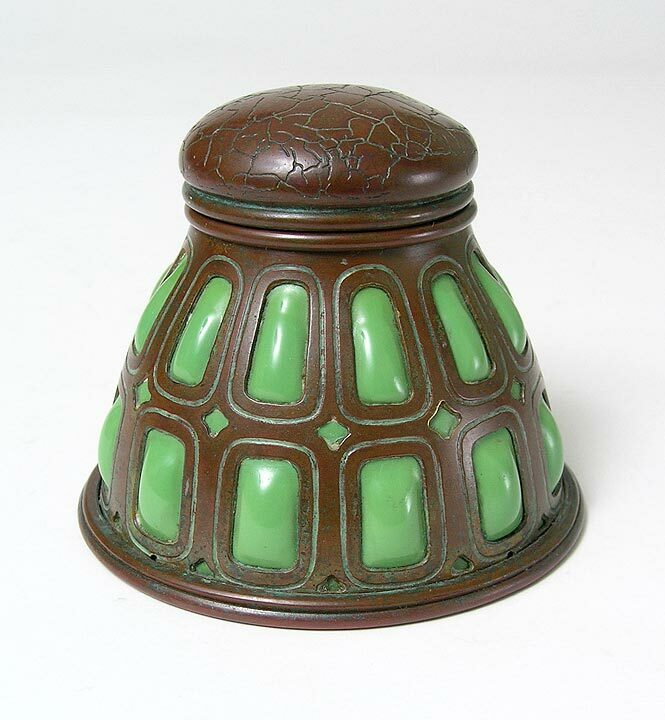 4½" tall x 4½" diameter. Signed. Mint condition. 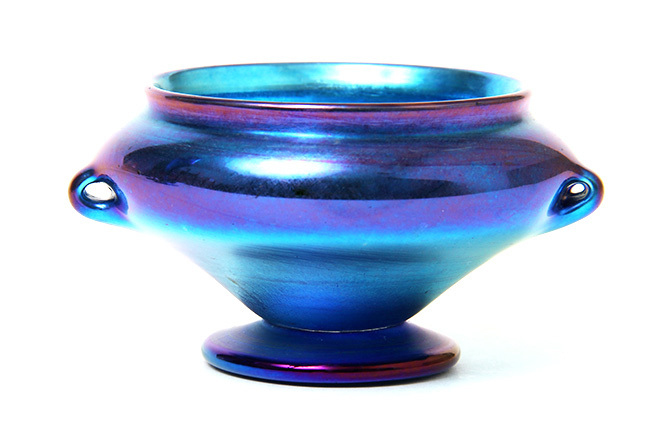 Great iridescence on this peacock blue compote. Nice size at 6" tall x 6¼" diameter. Signed. Mint condition. 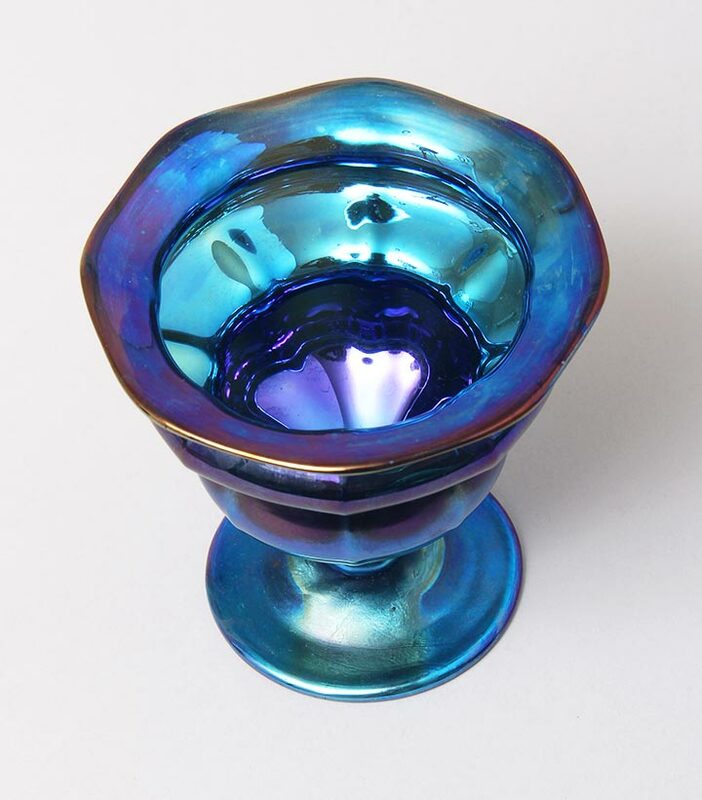 This diminutive blue Tiffany Favrile compote, 3½" tall x 3½" diameter, has strong blue and purple color and a beautiful mirror-like finish on the interior. It's an exceptionally nice example. Signed and numbered on the underside. Mint condition. 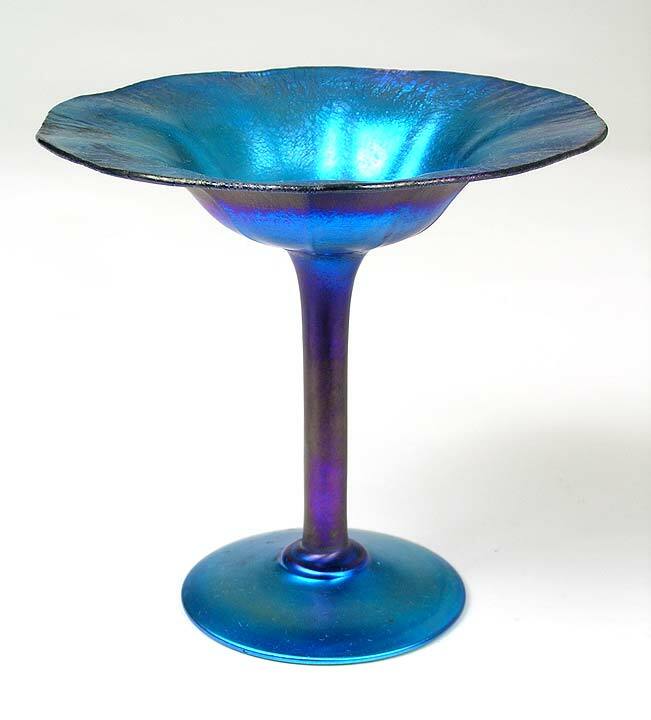 You probably know that blue Tiffany Favrile glass is rarer and more desirable than gold Tiffany Favrile glass. Decorated (in this case with green leaves & vines) blue glass is the next step up. 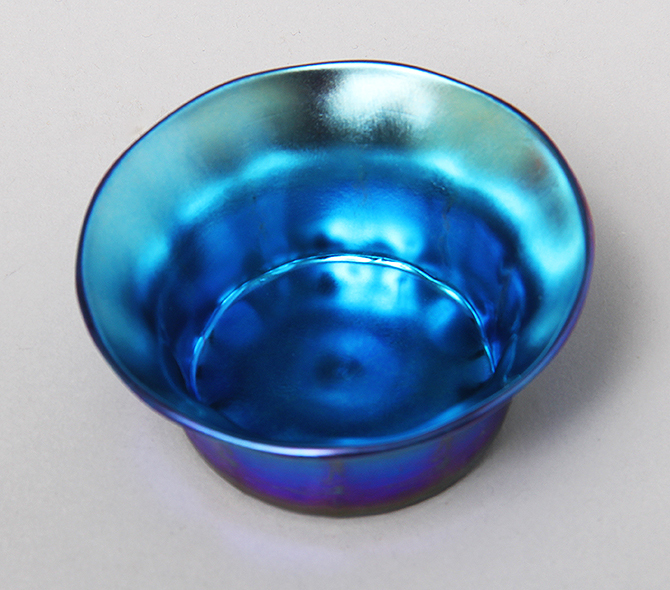 This little double-lobed bowl, 2¾" tall x 4½" diameter, is as good as this shape gets. 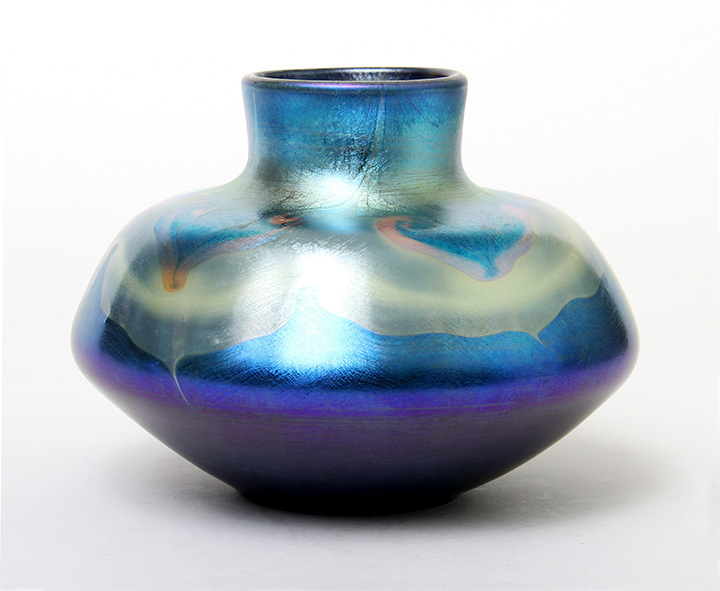 The color and iridescence are superb with strong blue on the exterior and purple on the interior. The form is elegant. The brass flower frog is original and almost always lost. It's a miracle this one survived 100 years. The condition is mint, with an original very minor flaw on the underside rim (visible in the third photo). 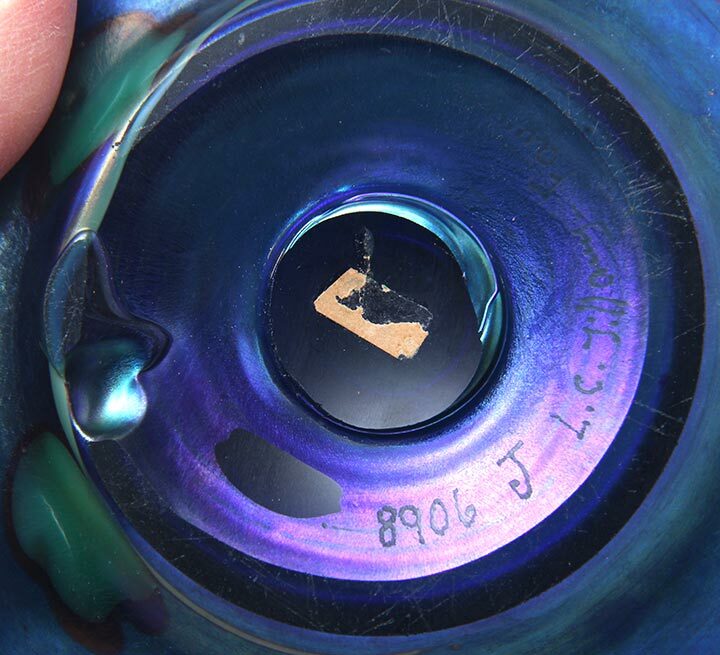 It's iridized, original to the day it was made, and only mentioned for accuracy. 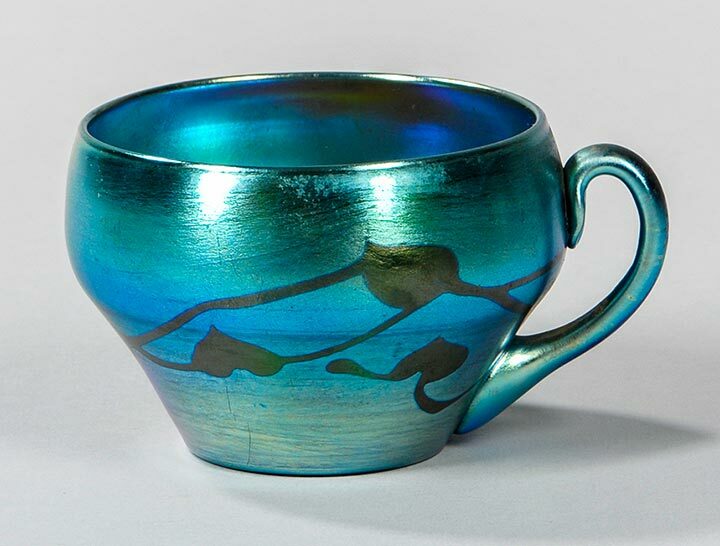 Tiffany didn't make many cups and certainly not in blue with hearts and vines decoration. This is a superb and rare example. Signed "5038C L.C.T.". 2¼" tall. Excellent condition. 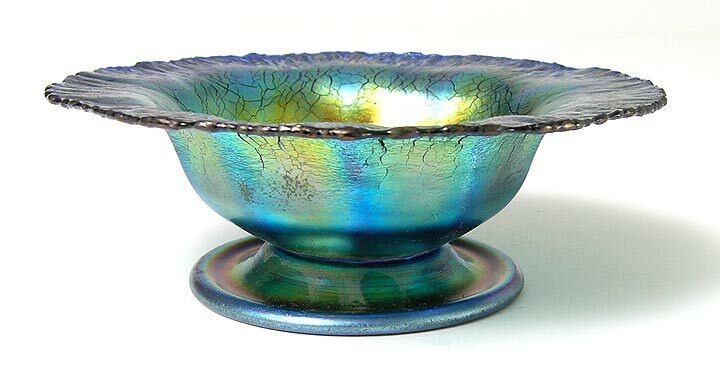 Decorated flower bowls are somewhat common in gold with green hearts but quite a bit rarer in the blue version. 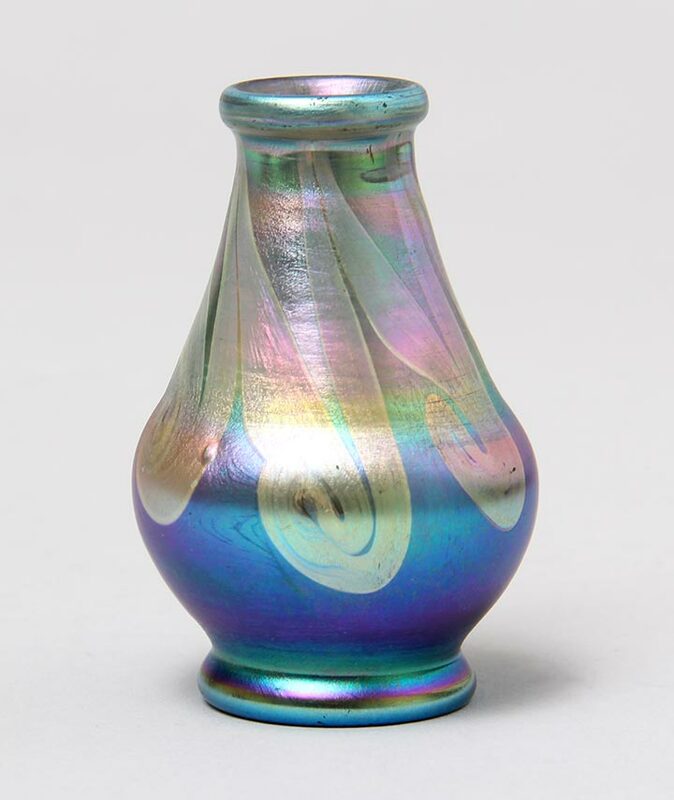 This example has exceptional color and iridescence with careful workmanship. The stretch glass is very effective and appealing. There is no damage to the loops on the flower frog, a common and important problem. This is a top notch example for any fine collection. It's a nice big example at 11¼" in diameter. Fully signed. Excellent condition. 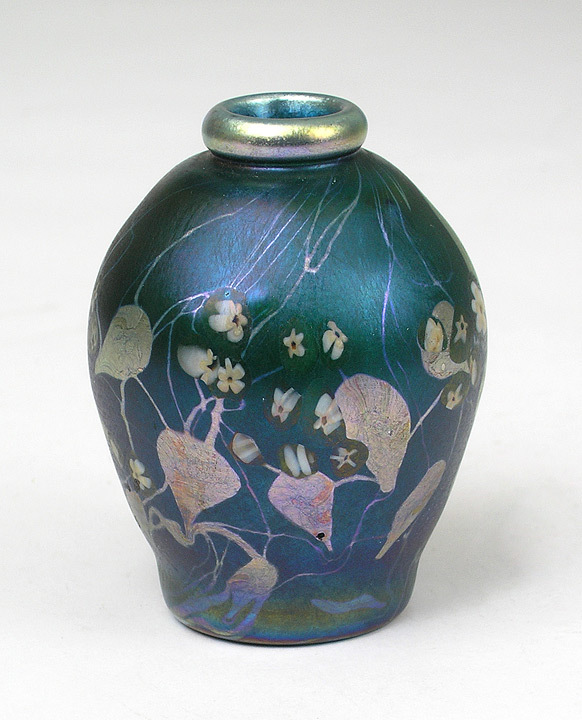 Tiffany blue decorated vases are much rarer and more desirable than gold or green examples. 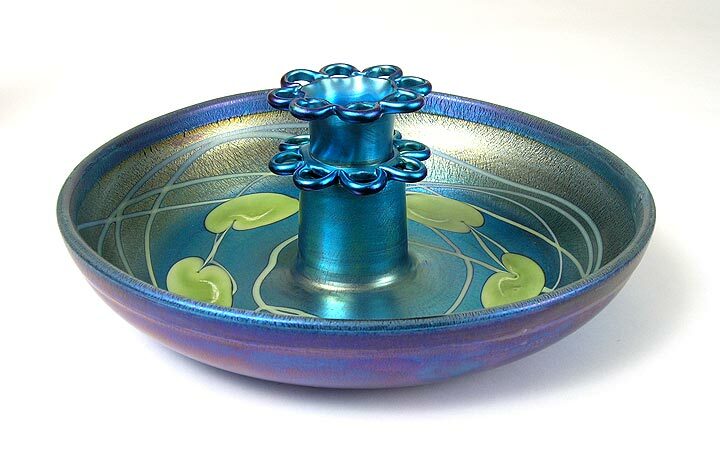 This little beauty is 2½" tall x 3" diameter. Signed. Mint condition. In order of rarity, gold is the most common, then green, then blue (then red). 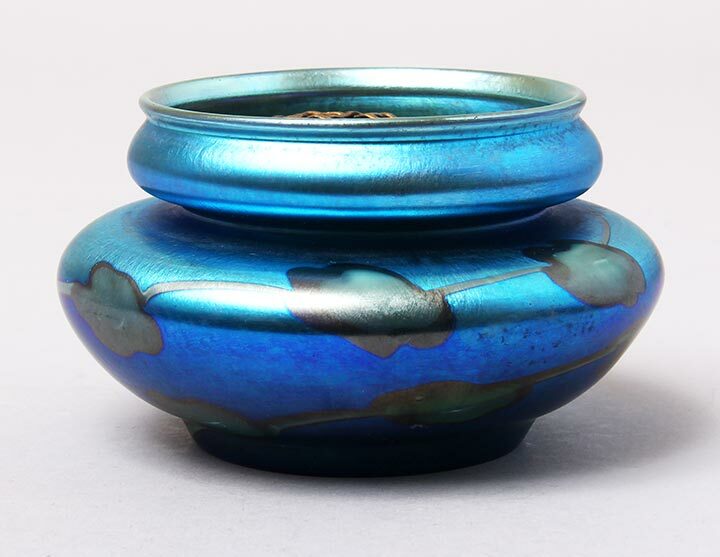 This rare mini vase has lovely blue coloration with a busy gold iridescent hooked feather decoration. Excellent condition, with a few tiny scattered scratches. 3" tall. Signed. 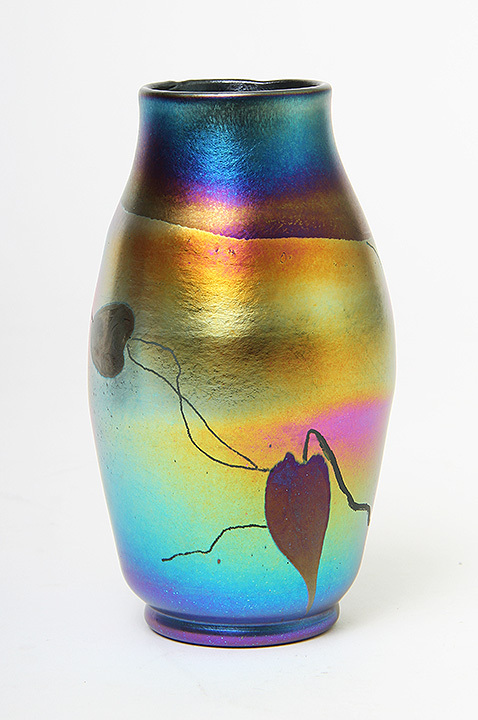 Is this vase great, or what? Really fantastic color and decoration, with a folded rim. You couldn't ask for better. For the best collections! 7¼" tall. Signed. Mint condition. Isn't this a wonderful vase? It's not very big, 5¾" tall, but what it lacks in size in makes up for in quality. It's a gem, with multiple, rare decorations, beautifully executed, and with deep colors on a deep cream background. Signed. Mint condition. I only get vases of this caliber once or twice a year. 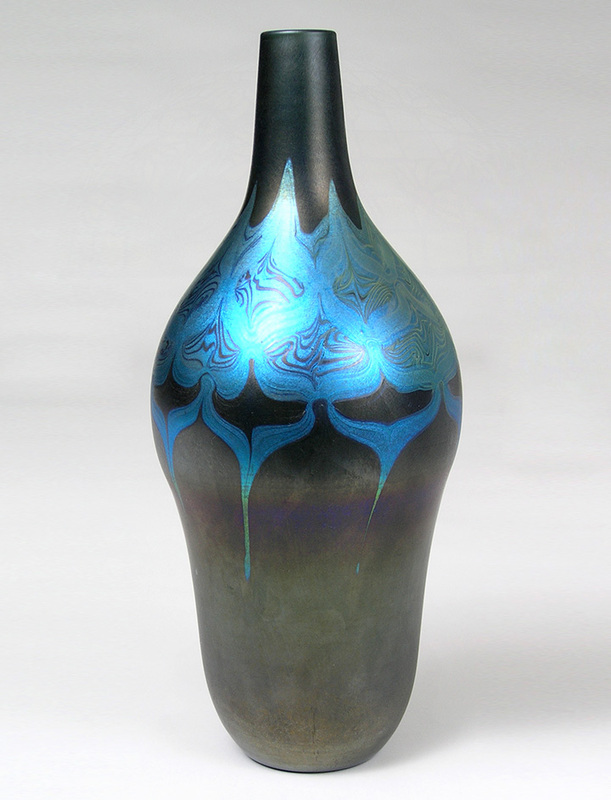 It's a killer example of iridescent gold decoration on strong blue. The shape is classic with a folded rim. This vase will not last long. Very nice size at 9¼". Signed. Mint condition. 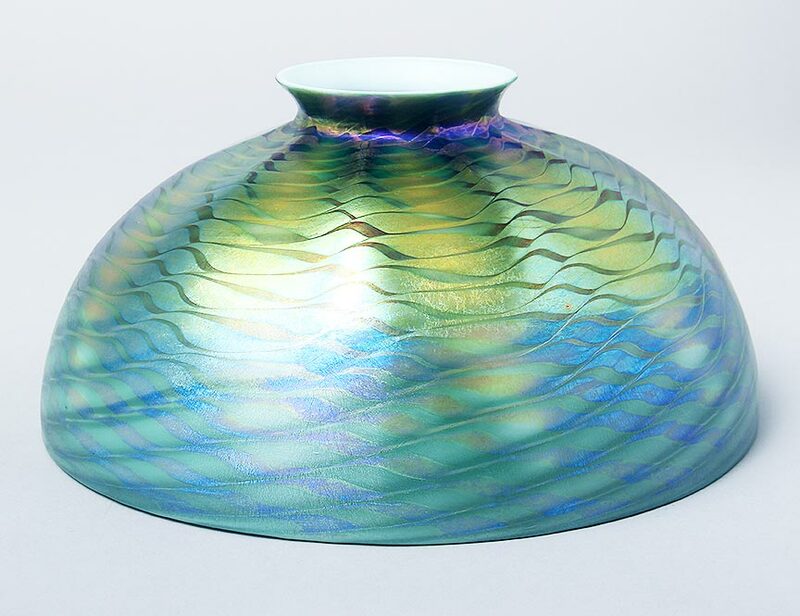 Is this Tiffany Favrile vase gorgeous, or what? I love it. Great decoration and color. 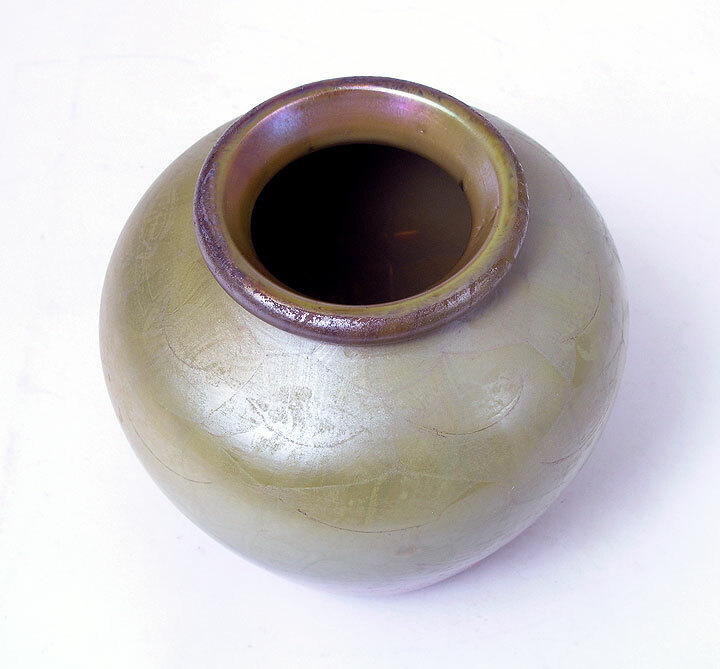 Substantial size at 4¾" tall x 6½" diameter. Signed. Mint condition. This shape is a Tiffany Favrile classic. It's found in different sizes, with different decorations. 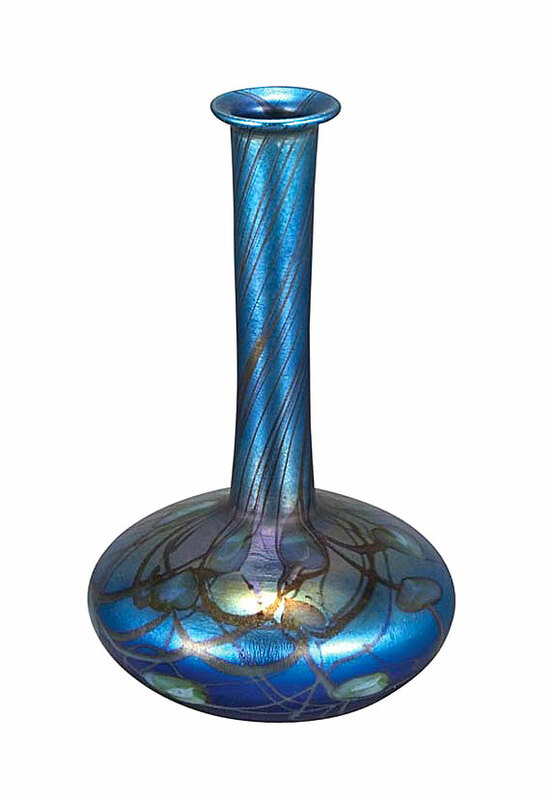 This combination of the small size (6") and the blue glass with green hearts and vines decoration is moderately rare and quite desirable. 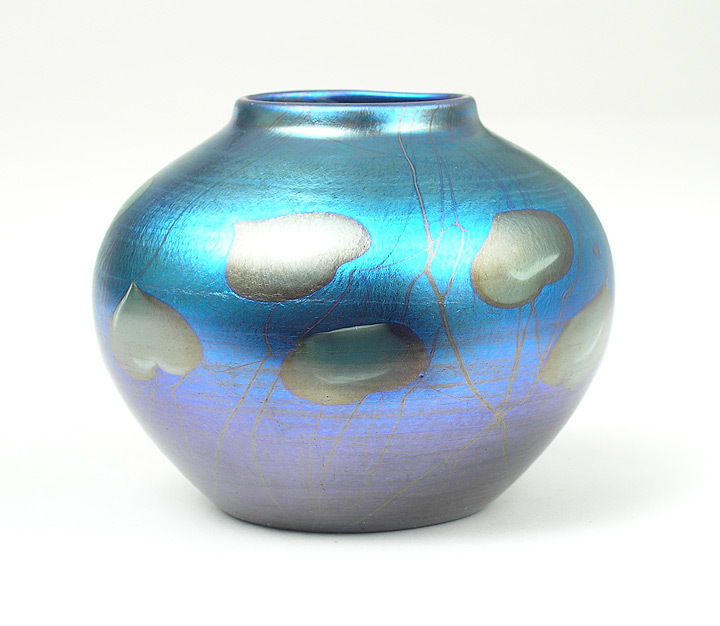 It's a really gorgeous mini vase, with great color. Signed. Mint condition. Just got four fabulous vases from a private collection. 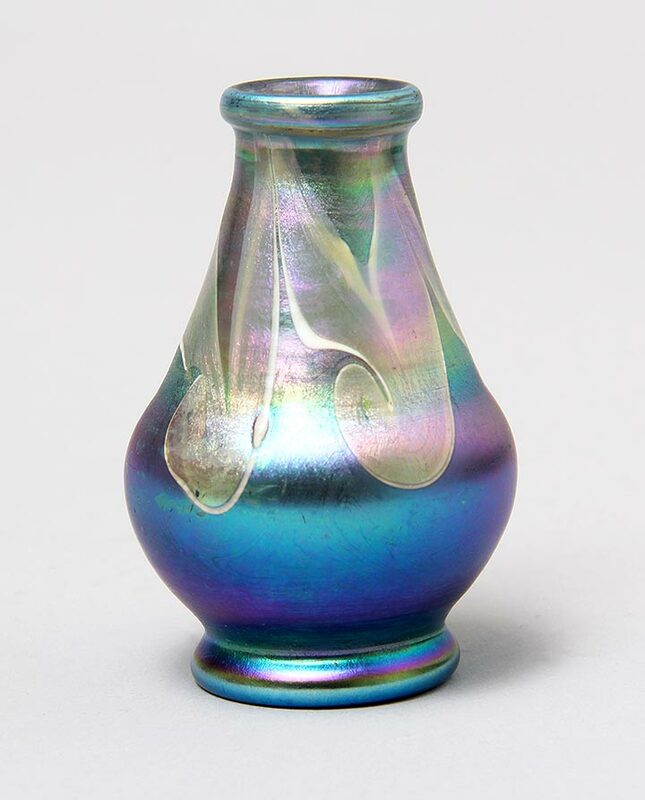 This special Tiffany Favrile example has busy vanilla and butterscotch hooked feather decoration on a blue background, with wonderful color and iridescence. The decoration is full and goes completely around the vase. It's a very fine example for the best collections. 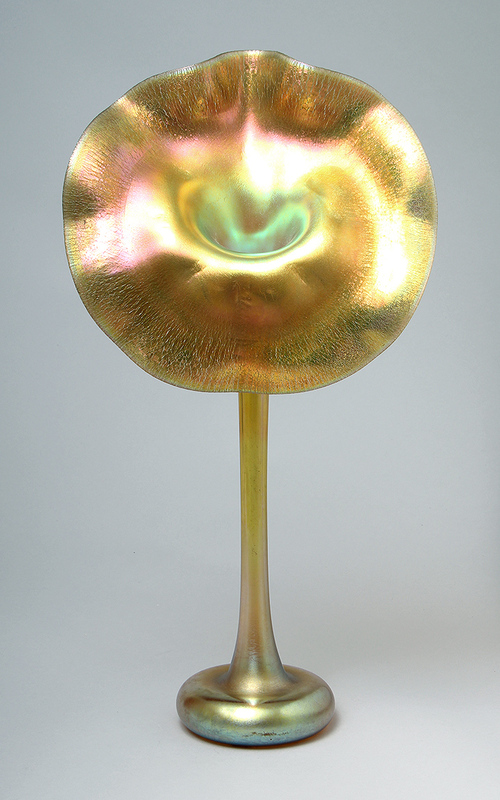 4¾" tall x 6¼" diameter. Signed. Mint condition. 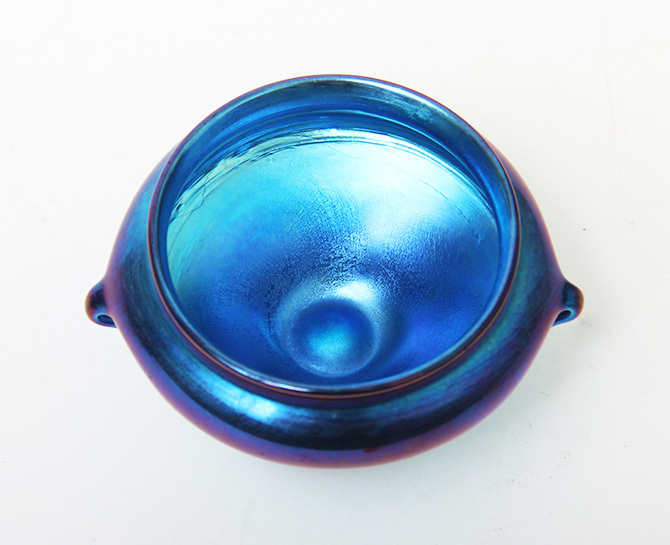 Any Tiffany Favrile blue salt is rare, but a flared one is even rarer. In fact, I can't remember the last time I had a flared blue salt for sale. This one has unbelievable color and iridescence. It was de-accessioned from the Museum of Fine Arts in Boston and still has the museum numbers underneath. Signed plus a paper label plus the museum numbers. Mint condition. Salts don't get any better than this. 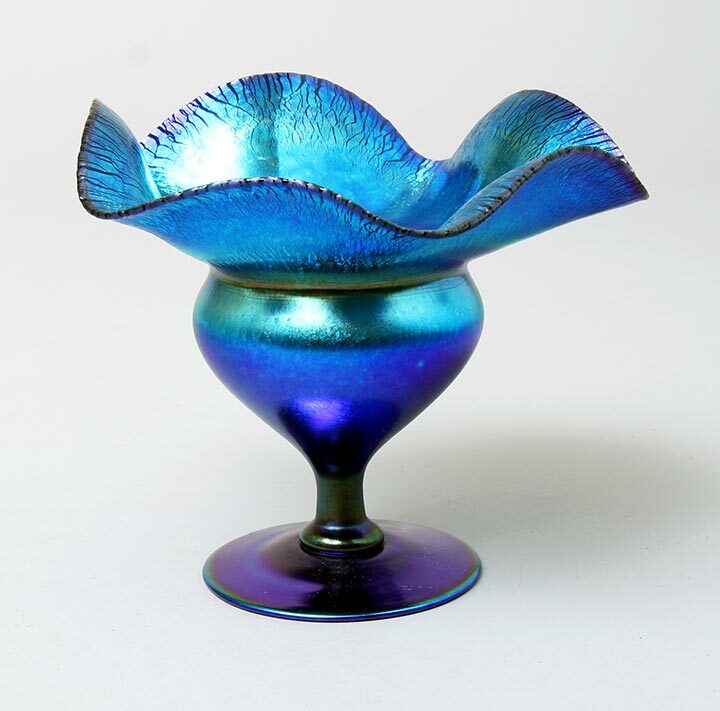 Tiffany Favrile 5-fluted compotes are relatively common in gold, but not in blue. 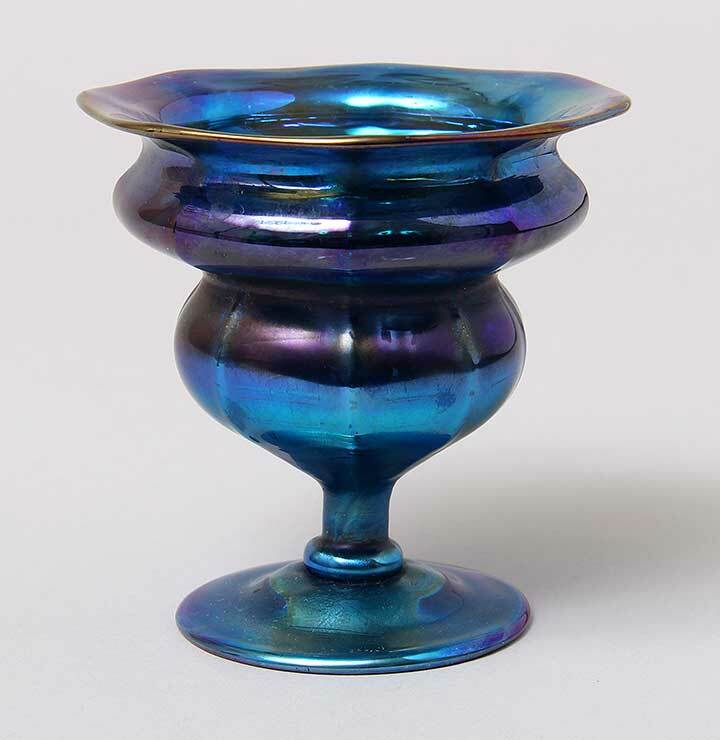 This example has very pretty stretched glass, with strong iridescence, ranging from blue on the flutes to incredible purple in the cup. 4¾" tall x 5½" diam. Signed. Mint condition. 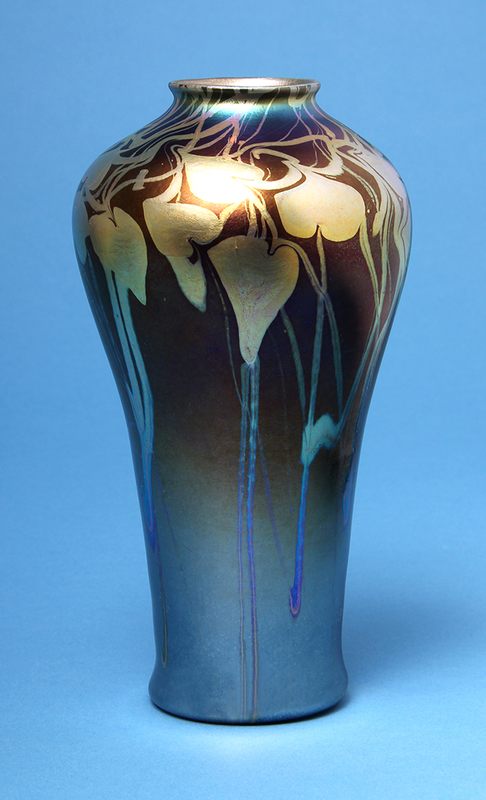 Tiffany Favrile blue vases are rarer than gold or green vases. 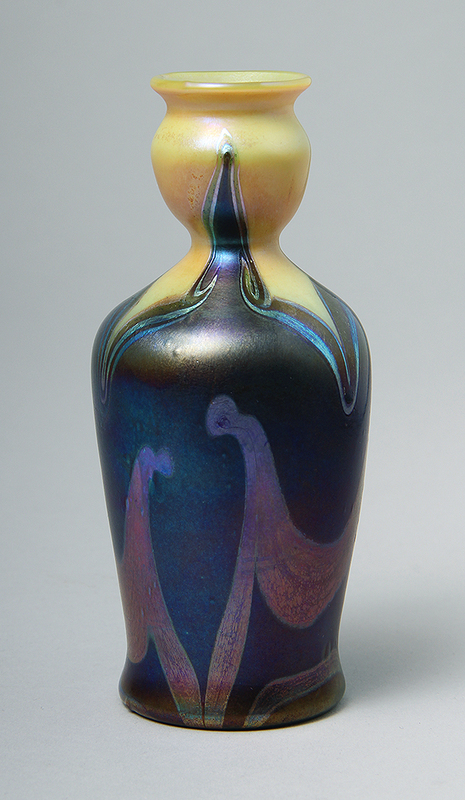 This example is not only blue, but blue decorated on blue, with excellent iridescence. The silvery-blue decoration is called hearts & vines and it's on a blue, shaded to purple background -- quite lovely. It's 6" tall, signed and in mint condition. 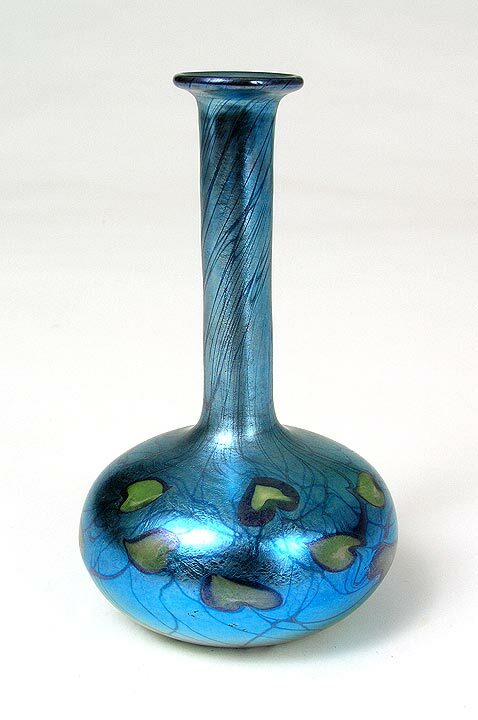 Another very fine example of great Tiffany decoration on strong blue. 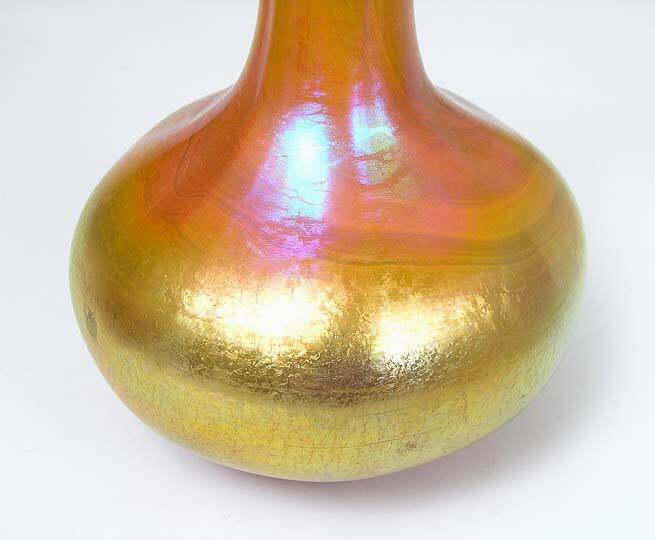 This vase comes in a gold version that is not nearly as rare or valuable. 6". Signed. Mint condition. 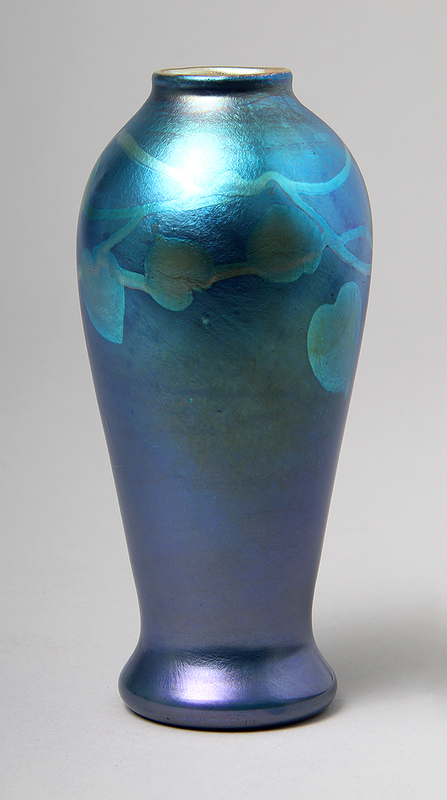 Tiffany Favrile blue vases are rarer than gold vases. With the busy hearts & vines decoration, it looks fabulous. Classical shape. 5¾" tall. Signed. Mint condition. 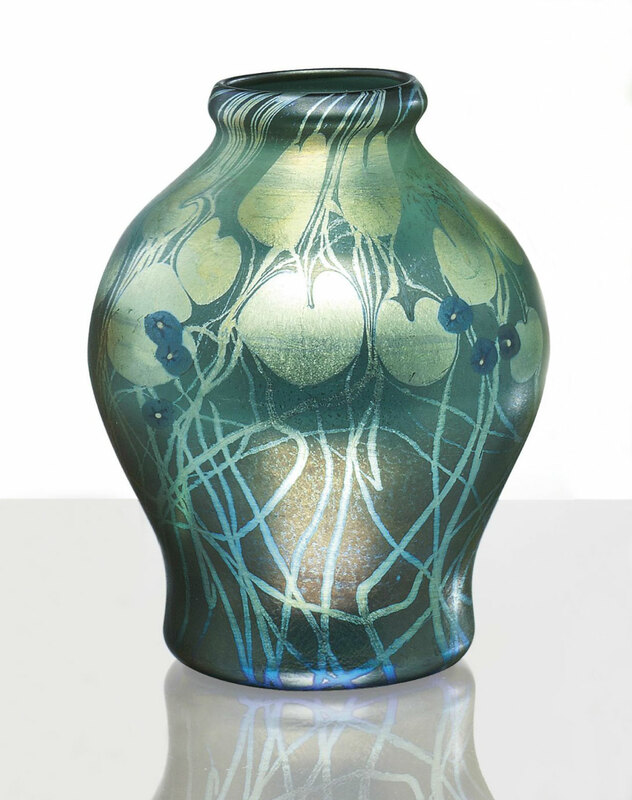 I've sold many Tiffany Studios Favrile blue vases, but I can't remember when I had one with such intense color and great contrasting green hearts & vines. I can't even call it blue -- it's more indigo -- just fabulous and big, 12¼". Signed. Mint condition. You couldn't ask for a finer example. Just got four fabulous vases from a private collection. 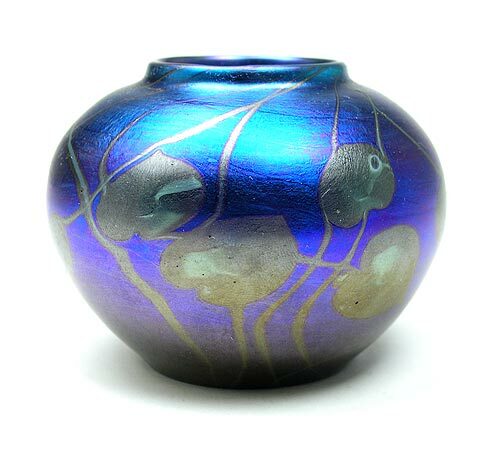 This wonderful Tiffany Favrile example has rare hearts and vines decoration, with really great color and iridescence. The sudden color change is reminiscent of lava decoration. The decoration is full and goes completely around the vase. For the best collections. 5¼" tall. Signed. Mint condition. Just got four fabulous vases from a private collection. This special Tiffany Favrile example is fully decorated with dark and light blue King Tut decoration, sometimes called Damascene. 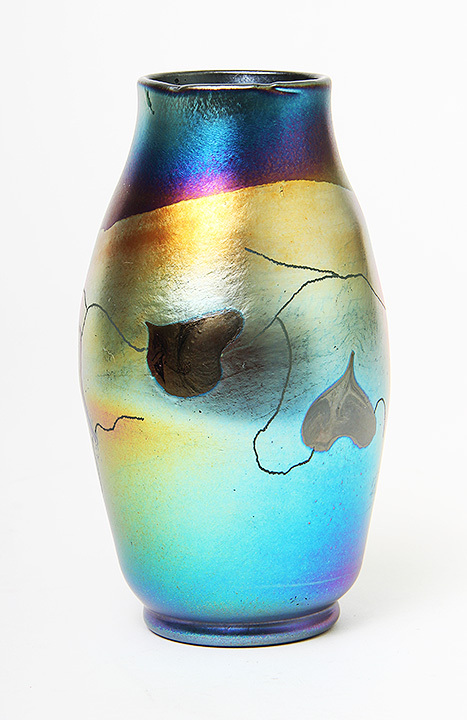 As with the other vases from this group, the color and iridescence are superb. 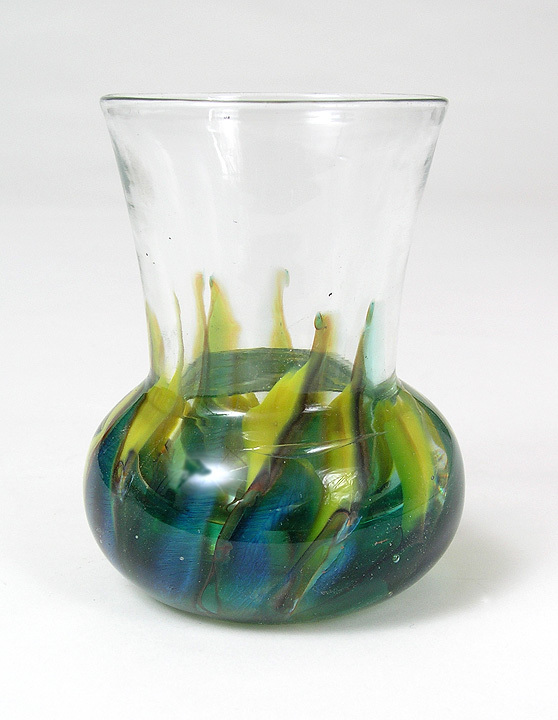 The decoration is full and goes completely around the vase. 4" tall. Signed. Mint condition. This Tiffany Favrile mini vase is a real honey. 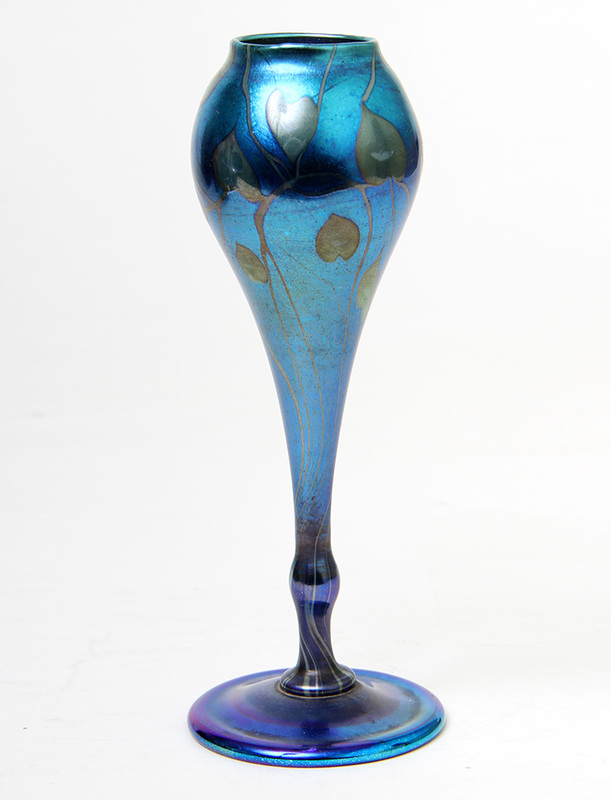 2¾" tall with superb King Tut decoration on very dark green to blue. Great iridescence. Signed. Mint condition. Millifiori is Italian for "a thousand flowers". 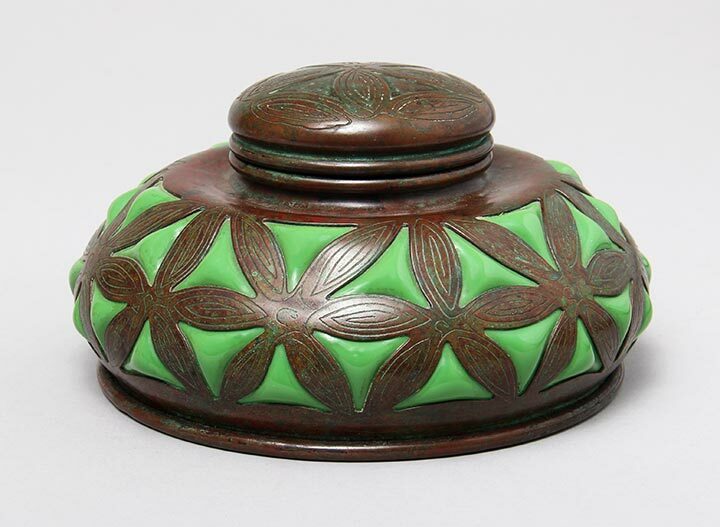 It's used to describe the floral decoration that is applied with glass canes. 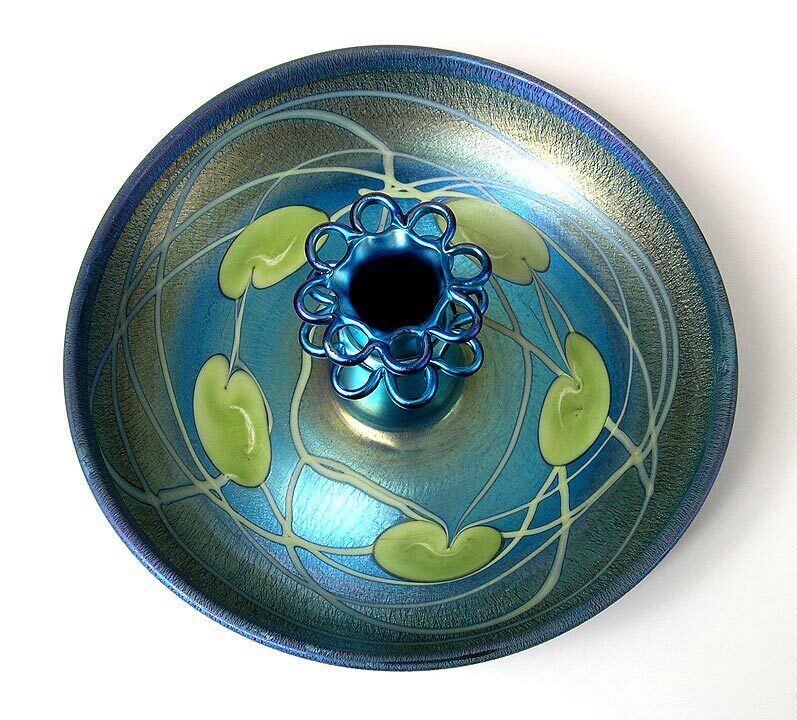 Tiffany didn't do this decoration often, so it's moderately rare, and much more so because of the dark green background. The rolled rim is another virtue. 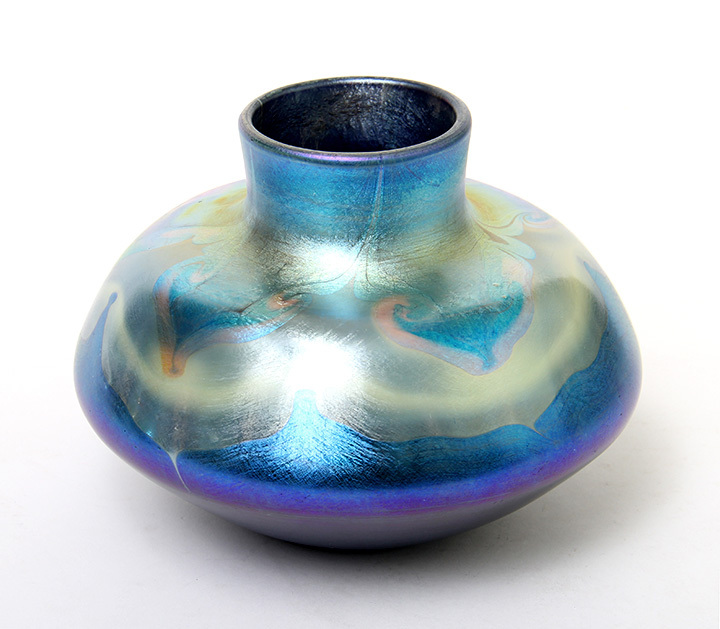 This 3" mini vase is an outstanding example. Signed. Mint condition except for a tiny burst bubble (that is visible in the second photo.) It's unimportant and listed only for accuracy. 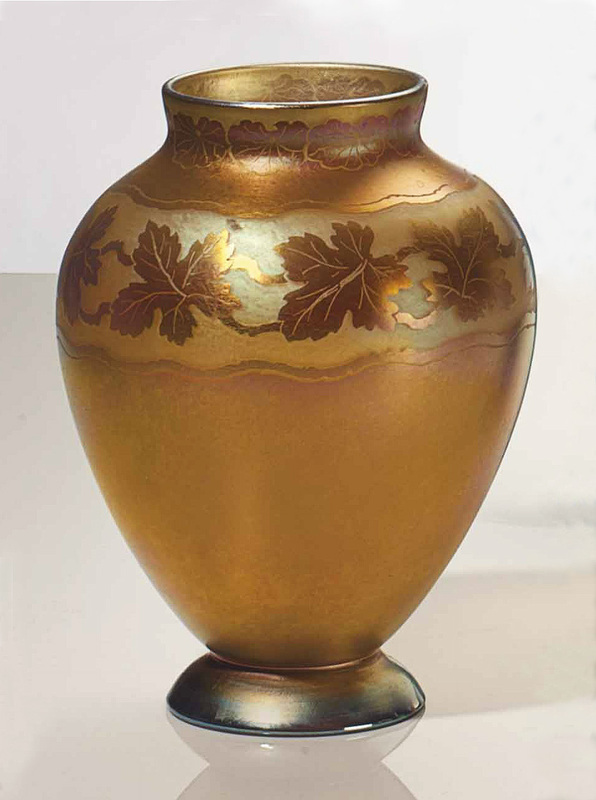 Tiffany Favrile millifiori vases are rare and desirable. They're usually found on a gold background. That's what makes this example so special -- the colors are unique and fabulous. Millifiori (thousand flowers) decoration was done with glass canes that were applied to the molten vase. It's a great technique that wasn't used often. This example also has extensive leaf and vine decoration. It's an important vase for the best collections. 5" tall. Signed. Mint condition. 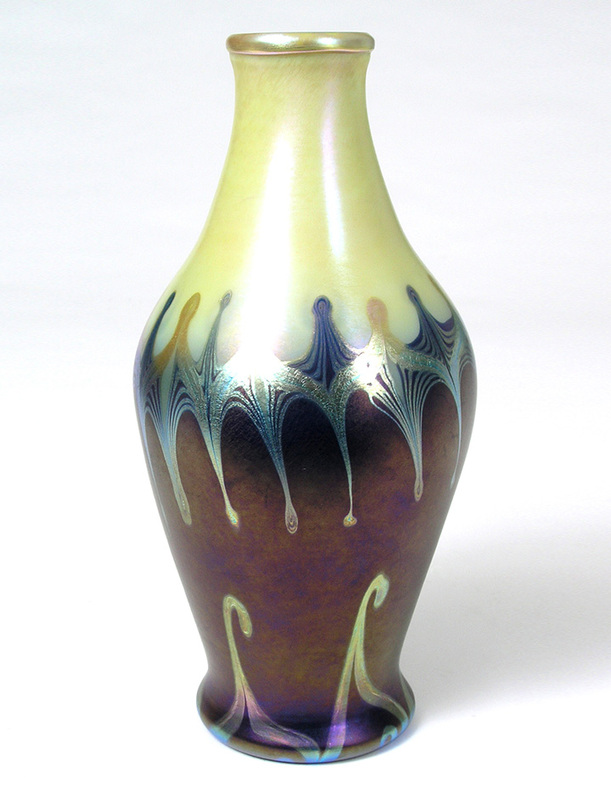 I've owned this shape in Tiffany before (see vase #51255 below), but only once in this wonderful mini size, 7¼" tall. The color and iridescence are spectacular. Signed. Mint condition. I've owned this same model before. What I've noticed is that each is consistently fine with iridescent hearts & vines on an iridescent ground shading from blue to deep indigo at the base. 3" tall x 3½" diameter. Signed. Mint condition.